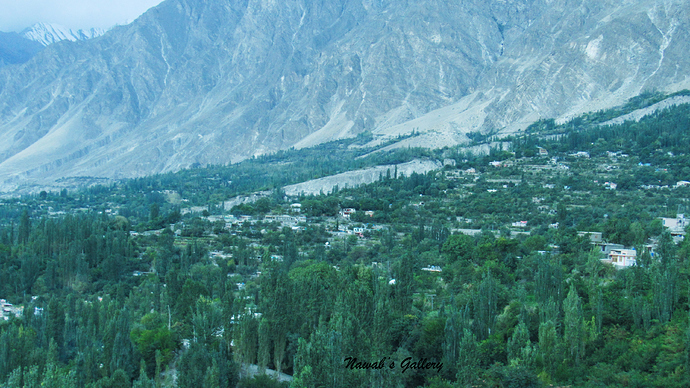 Hunza, also known as the ‘Heaven on Earth’ is our most favorite place in Pakistan, especially the Karimabad City. It is at a distance of nearly 200KM from Gilgit city and of approximately 3 hours of drive through most scenic and beautiful valleys. 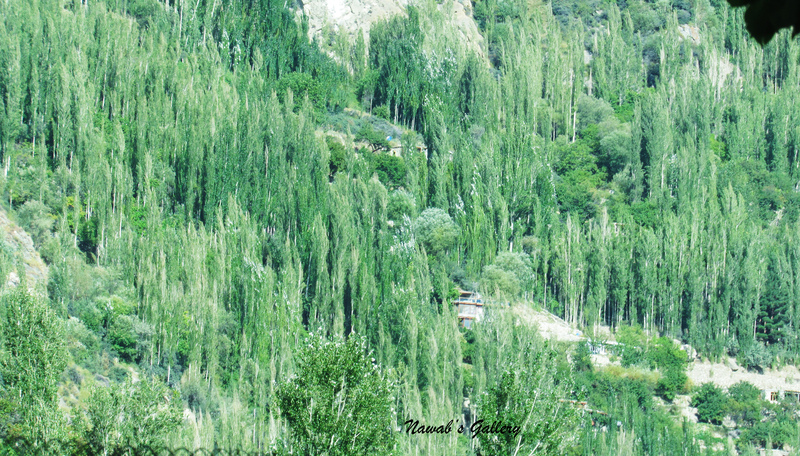 We last visited Hunza on our trip to Khunjerab Pass and stayed there for 3 days, and it is part of our current itinerary too. As we have left the jeep that, we hired from Raikot for our Skardu trip, so we ask the Hotel staff to arrange for a car that can drive us to Hunza. Finishing our breakfast we placed our luggage in the car and our trip to Hunza started. 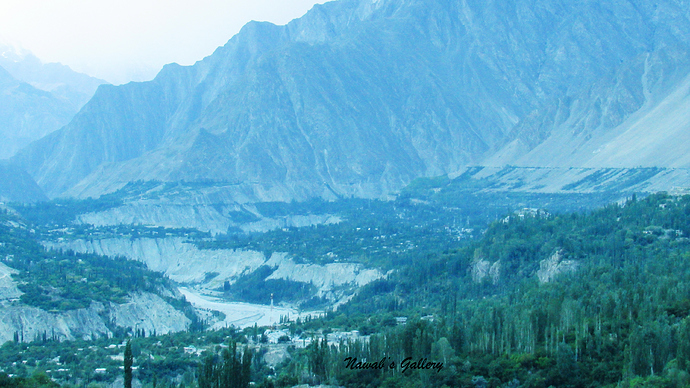 Hunza Valley situated at an elevation of 2,438 meters is one of the most exotic places in Pakistan. 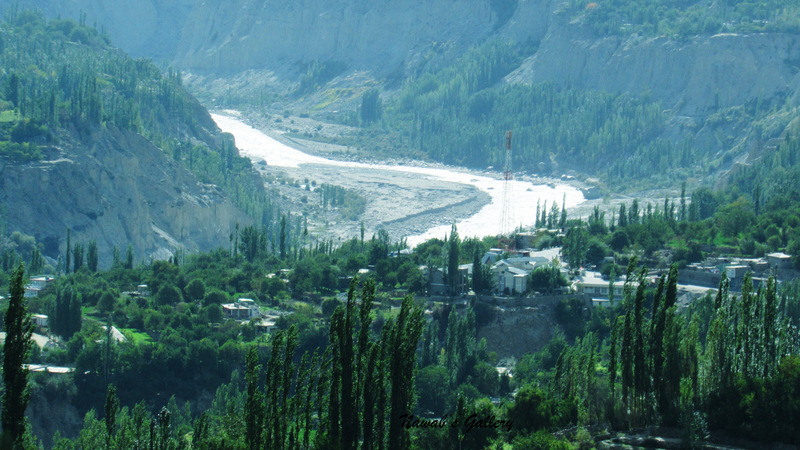 Surrounded by several high peaks rise above 6,000m, the valley is divided into three regions, Upper Hunza, Centre Hunza and Lower Hunza. 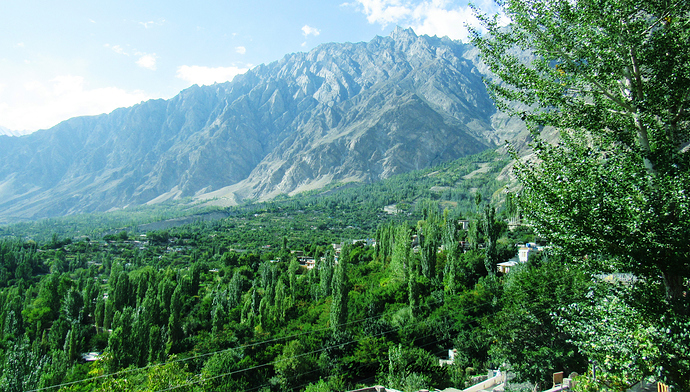 Karimabad is the capital of Hunza Valley, lay in Centre Hunza region, and is named after Prince Karim Aga Khan, the spiritual leader of the Aga Khan Community. Hunza valley provides spectacular views of some of the most beautiful and magnificent mountains of the world that include: Rakaposhi 7,788 m (25,551 ft), Ultar Sar 7,388 m (24,239 ft), Bojahagur Duanasir II 7,329 m (24,045 ft), Ghenta Peak 7,090 m (15,631 ft), Hunza Peak 6,270 m (20,571 ft), Darmyani Peak 6,090 m (19,980 ft), and Bublimating (Ladyfinger Peak) 6,000 m (19,685 ft). 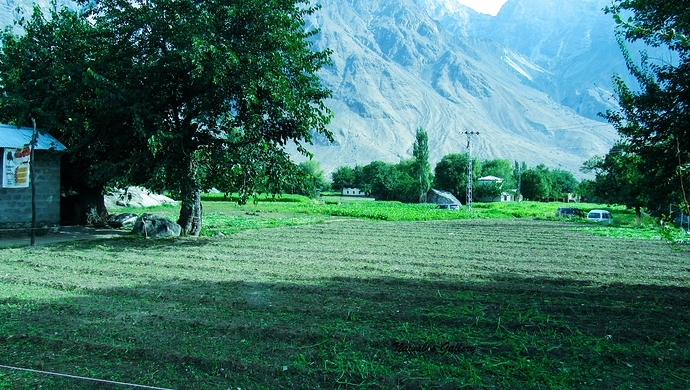 We are in the Kingdom of Himalaya and Karakoram with K2 (Godwin Austen), Nanga Parbat and other world’s highest mountains nearby, along with both sides of Karakoram Highway there are green plains and valley surrounded by mountains with their summit covered with snow, these mountains are part of the Himalaya and Karakoram ranges. 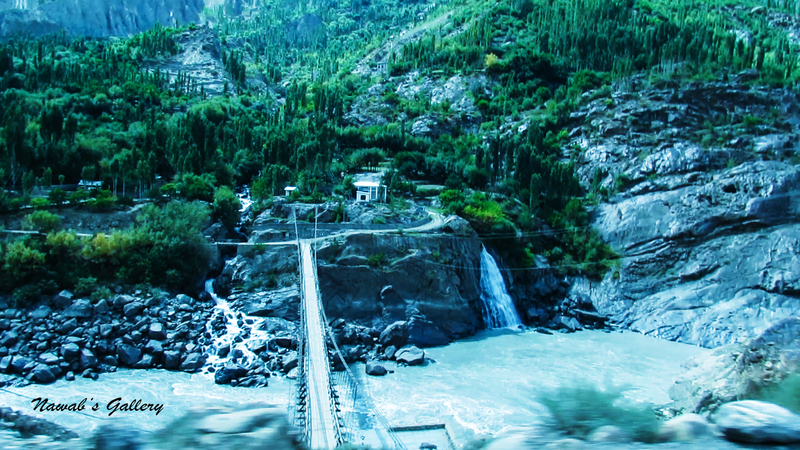 Considering the marvelous scenery and passing different cities like Sultan Abad, Rahim Abad, Chalt Valley, this is an extremely beautiful valley and visible from the Karakoram Highway on the other side of the river. 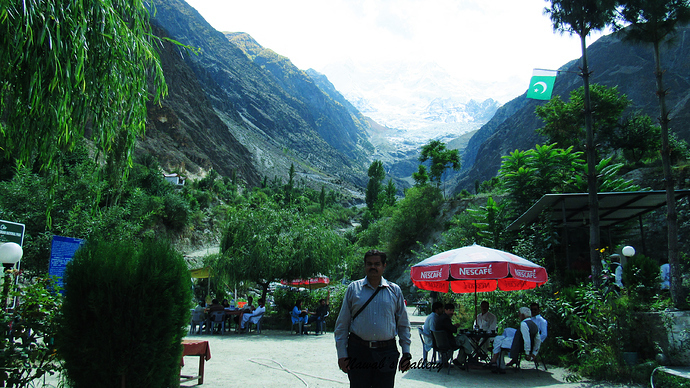 Crossing many cities, we stop at a point known as Rakaposhi View Point. 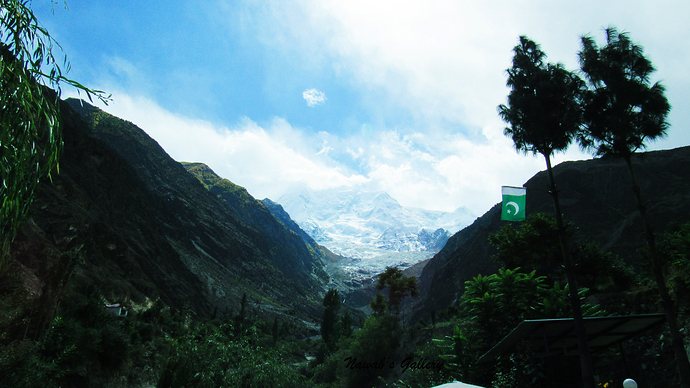 This is the base of Rakaposhi Mountain and complete view of the mountain, along with its peak is clearly visible from this place. 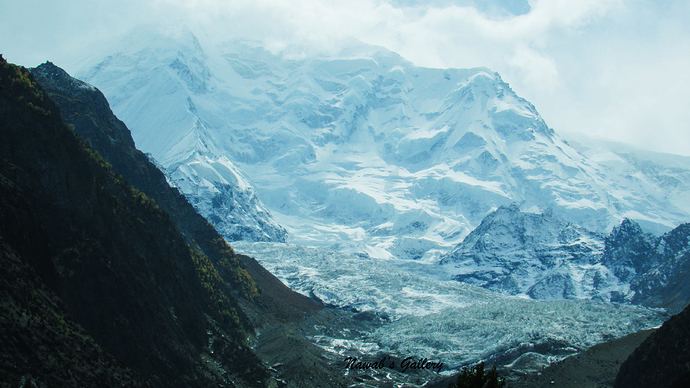 Rakaposhi, famous as the crown of Hunza & Nagar Valleys is the 12th highest peak in Pakistan and the 27th in the world with a height of 7788 meters. It is the highest unbroken slope on earth with its gleaming Gulmit glacier. 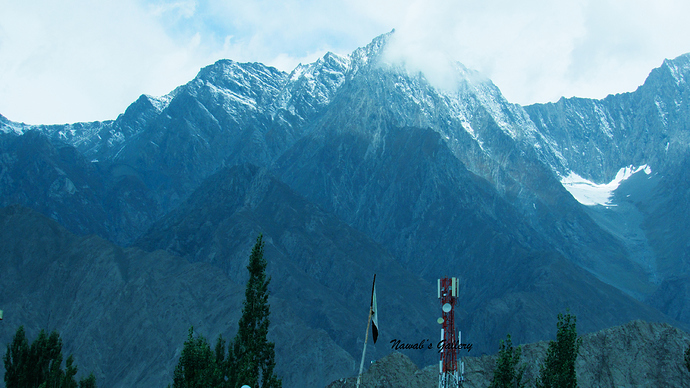 The summit is almost 6 kilometers (5,838 meters) from Karakorum Highway. 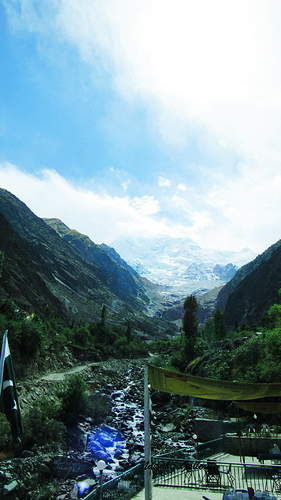 Rakaposhi is the only mountain on earth that plummets directly, uninterrupted, for almost 6,000 meters from the summit to its broad base, which measures almost 20 kilometers east to west. From this spot, the complete aspect of the mountain, along with its peak is clearly visible. Thither is a restaurant, tuck shop and gems & handicraft shop. Cold and clear water is flowing from the glacier; we sit along the stream to enjoy this marvelous place. 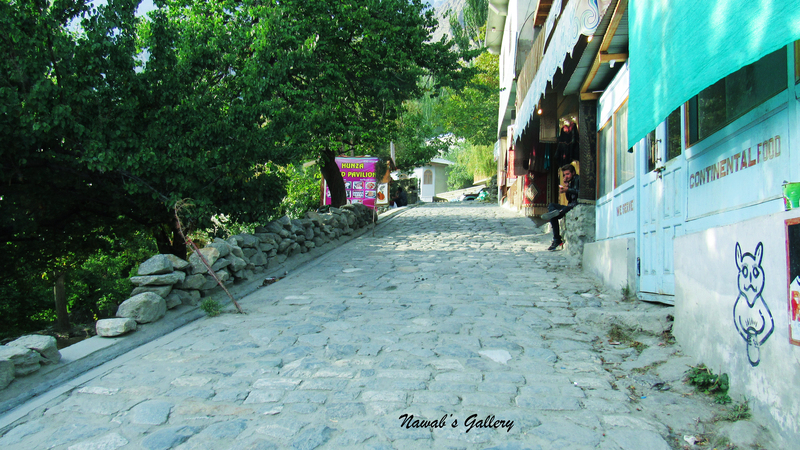 Capturing some photos our trip to Hunza started again. 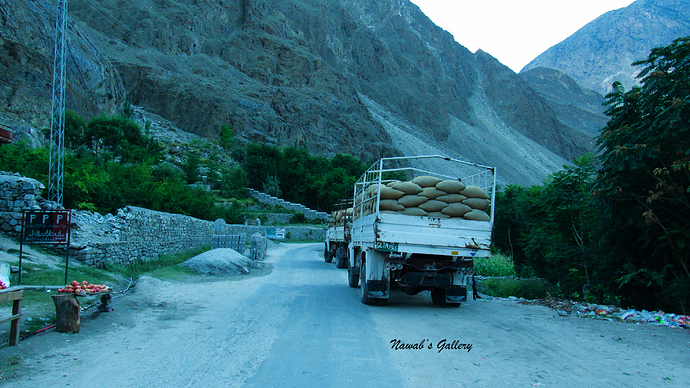 We are very fond of dry fruits especially from Gilgit-Baltistan, so we ask our car driver to stop at Aliabad for buying some dry fruits. Situated on the main Karakoram Highway Aliabad is a business and commercial hub of this area. 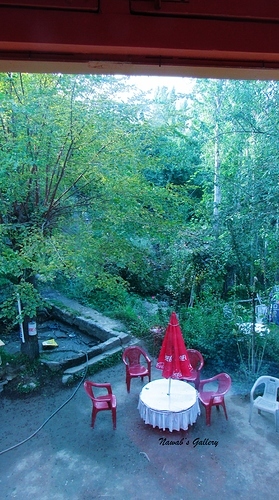 There are many hotels, restaurant, shops, banks and markets in Aliabad. 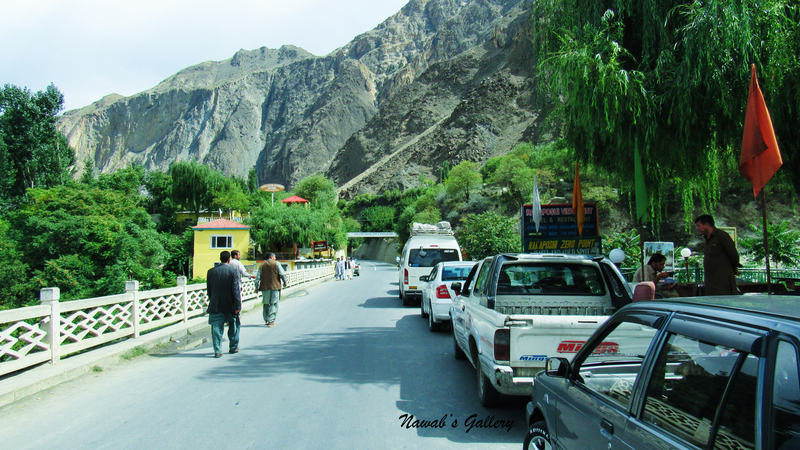 Being on the Karakoram Highway this city is very busy and somewhat more crowded than the other towns in this area. 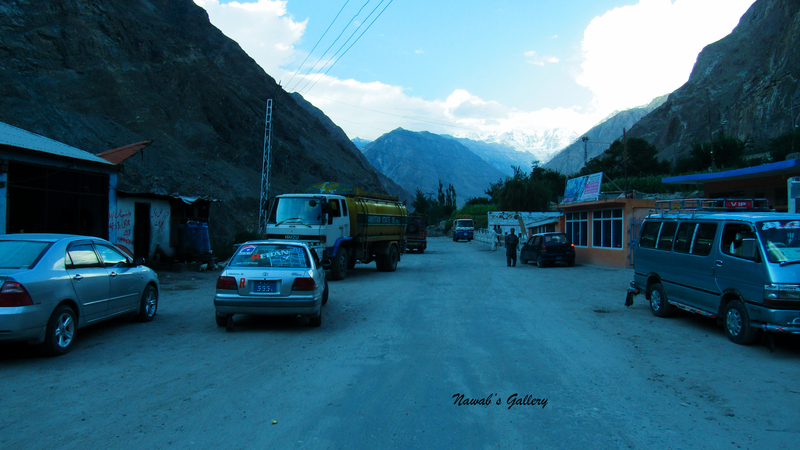 People traveling toward Passu, Gulmit, Gojal, Sust, Khujerab, and China mostly break their journey at Aliabad for a rest and night stay. There are many transport companies operating in Aliabad. Many different types of transport like Buses, Coasters, Van, and Taxies are easily available here to go to different places in Gilgit-Baltistan and even to Rawalpindi. 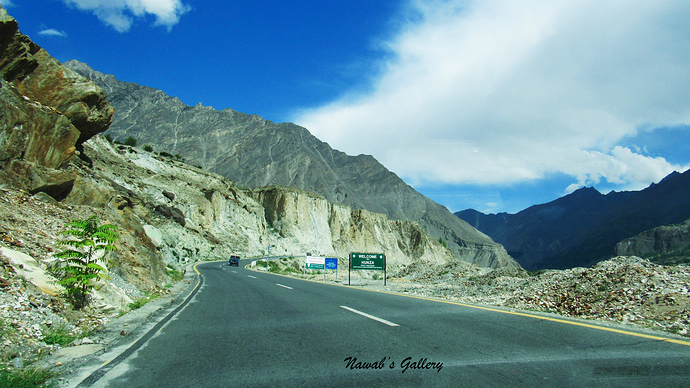 Subsequently, a couple of kilometers from Aliabad we left Karakoram Highway and struck a left turn on an ascending road and in nearly 3 hours of drive from Gilgit we reached Karimabad city. Thither are many hotels in Karimabad, infect there are all hotels along the main road of Karimabad since Karimabad is a tourist place. 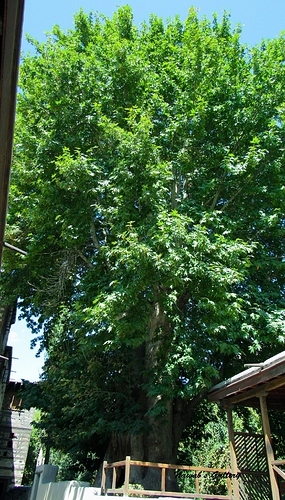 All around the year, there is a number of tourists visiting this area, particularly in the summer season. 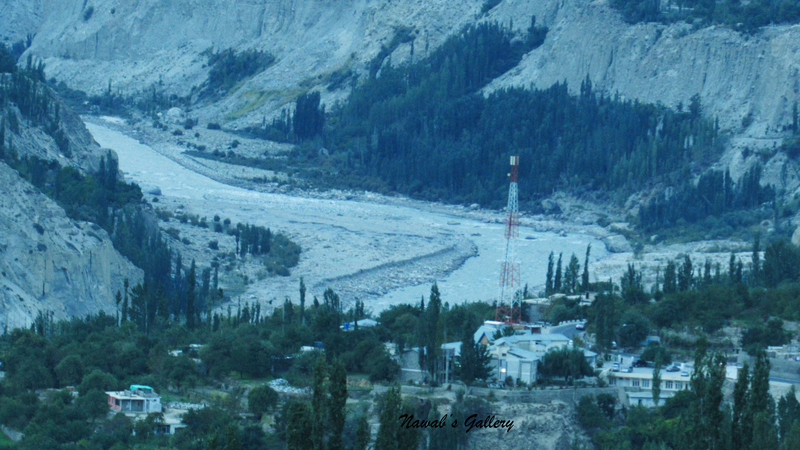 In that respect are both luxury and budget hotels in Karimabad. 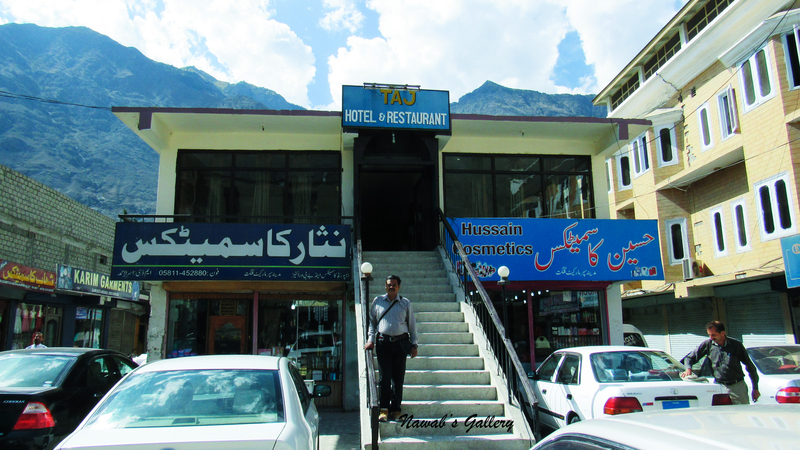 However, we decided to stay at Hotel Blue Moon situated near the main market in Karimabad city, the same hotel where we stayed on our last visit to Karimabad. On the ground level are the shops and climbing some steps is the reception and food court of the hotel. Rooms start from the foremost floor. 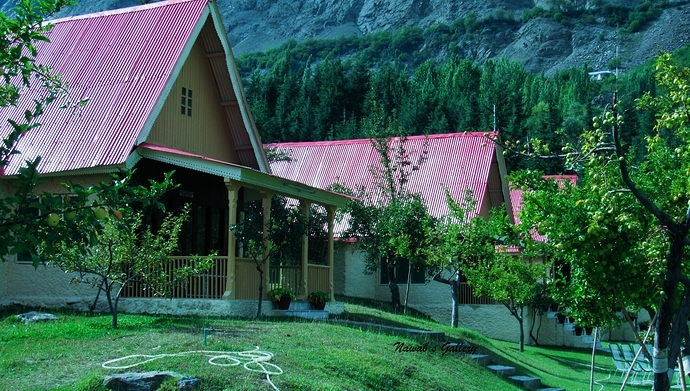 The hotel is at an awesome location, in front there is the beautiful valley of Hunza, with the view of Rakaposhi Mountain and behind is the snow-covered mountains of the Ultar Sar Peak and Ladyfinger Peak. Ultar Sar is the southeastern most major peak of the Batura Muztagh, a subrange of the Karakoram range. 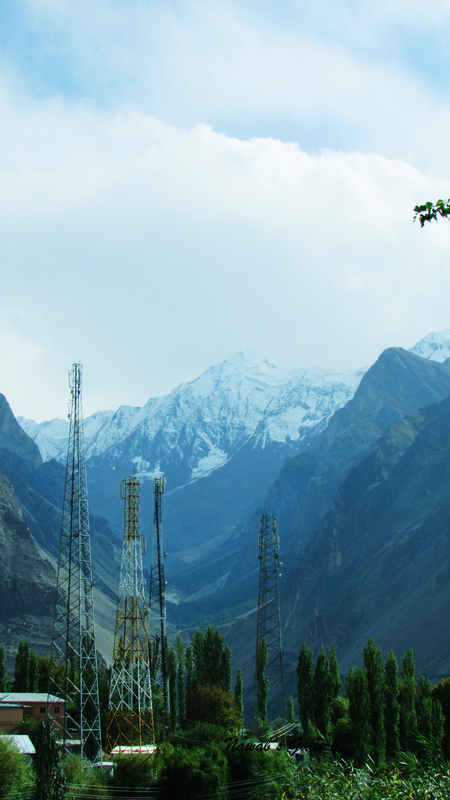 It lies about 10km northeast of the Karimabad city and rises over 7,388m (24,239ft). 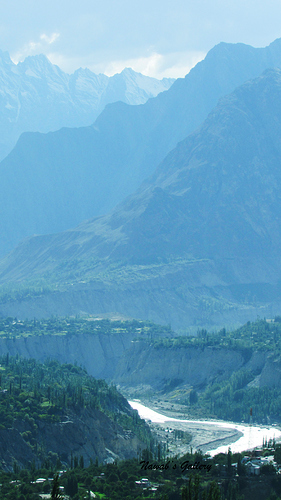 The adjacent peaks are Shispare, Bojohagur Duanasir, Hunza Peak and Bablimotin. 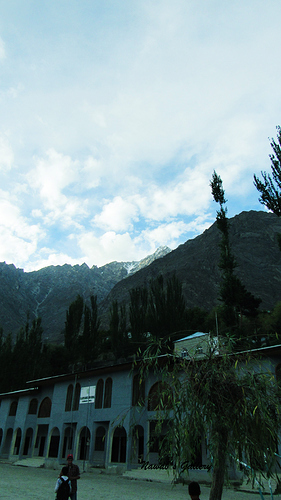 Another popular peak at Karimabad is the Ladyfinger peak. It rests on the southwest ridge of the Ultar Sar massif, the most southeasterly of the major groups of the Batura Muztagh. 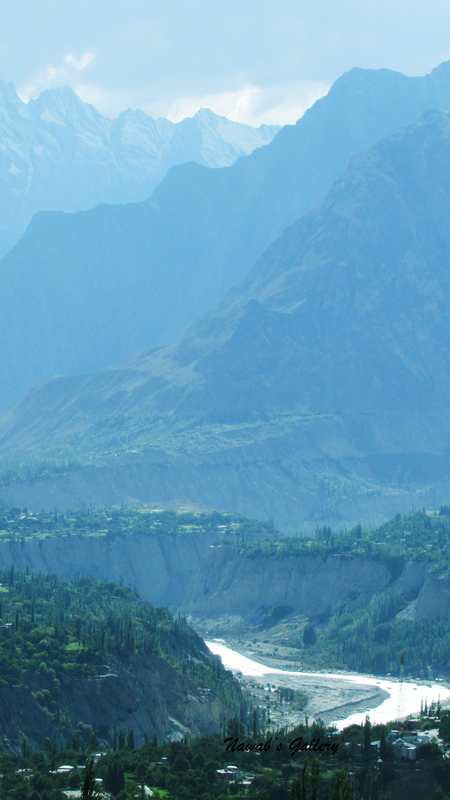 The whole massif rises precipitously above the Hunza Valley to the southeast. Hotel Blue Moon is an average hotel in an old building, on our last visit it was not well painted, no beautiful carpets but the service and the staff was excellent but this time it was all opposite, the building was painted, they have new carpets but the staff is lazy and careless. 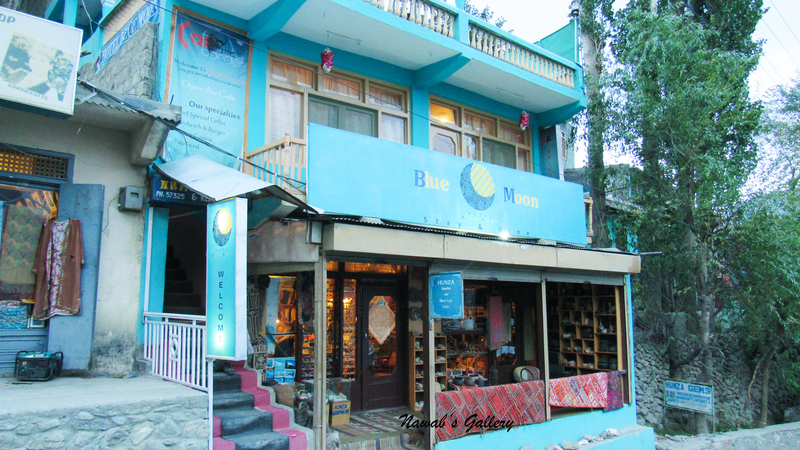 However, because of its excellent location, we decided to stay at Blue Moon. From the balcony of the hotel, we can view the hypnotizing scenic view of The Hunza Valley. The valley in front of us is lush green with countless trees of Apple, Apricot, Walnut and many more; below in the valley, we can abide the Hunza River flows in between these trees. Either you look in front, at the left, right or back there are trees all around surrounded by snow-covered mountains. In addition, from the rooftop, at the back of the hotel, the view was alluring; from here, we can see the valley of the Altit and Duikar. The green plains, the woods, the sights and the waterfall on the Altit side is magnificent and the historic Altit Fort and the Eagle’s Nest in Duikar can be observed at a distance. The spectacular view makes us feels like we are on the roof of the world, surrounded by snow-covered mountains. No wonder this place is famous as the “Heaven on Earth”. While we settled ourselves in the hotel, my wife told me that she is going to visit her friend in the valley that is in front of the hotel. The family of my wife’s friend owns a big portion of the garden in this valley where they also own a house. My wife and children walk down the valley to meet her friend while I take a nap in the hotel. Nearly after an hour, my family return and then I also went downstairs on the main road and started to walk toward Karimabad Bazar. 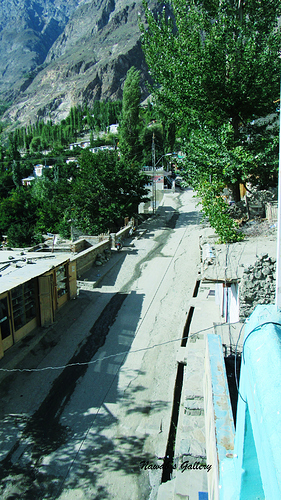 Karimabad city is built along the border of the mountain and is sloped upward to Ultar Sar starting from Karakoram Highway. Along both sides of the main road, there are stores and hotel buildings, the residential houses are below either in the valley or just little up on the mountain. There are many shops along both sides of the main road; we went into the first shop that is on the left-hand side of the road directly after our hotel. This shop sells gems and jewelry and is led by local women. From the time we arrive in this area we found its people courteous and soft-spoken, they steer us at every spot and quick to offer any sort of assistance. 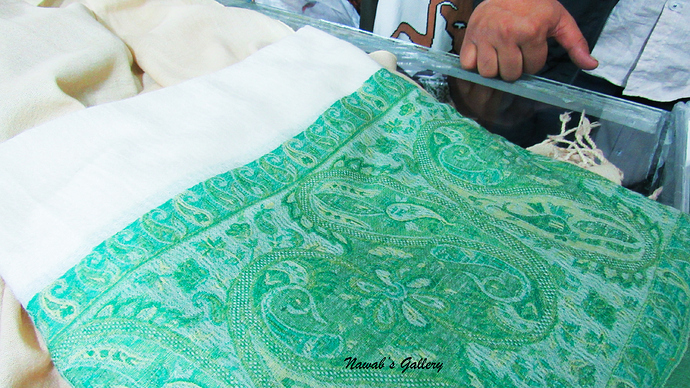 After visiting this shop, we move toward another shop on the road this shop sells handmade rugs and carpets. These carpets are extremely beautiful and nicely woven by the local workers, there are also handmade jackets and shawls, and since my wife loves shopping, she immediately started bargain and pick the items. The Hunza valley is popular for Camping, Swimming, Hunting, Hiking and Trekking, Mountaineering, Mountain Biking, Horse riding, Eco tours, Skiing, Safari tours, Fishing, Gliding and many other activities, for that there are many shops in Karimabad that sell equipment required for these activities. The equipment can either bought from here or rented from these stores. 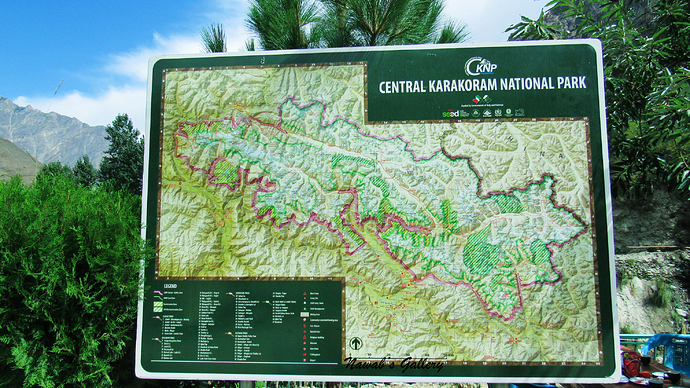 Paper maps of these areas are also available in nearly every shop and one can even hire a local tour guide for hiking and trekking. 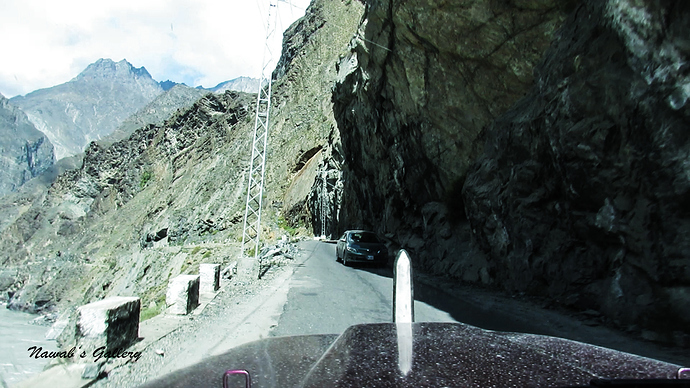 Going forward, there is a link road leading upward toward Baltit Fort this is a 700 year old fort and belongs to Mir of Hunza (but it is vacated by them in 1945) and is now considered as World Heritage by UNESCO. 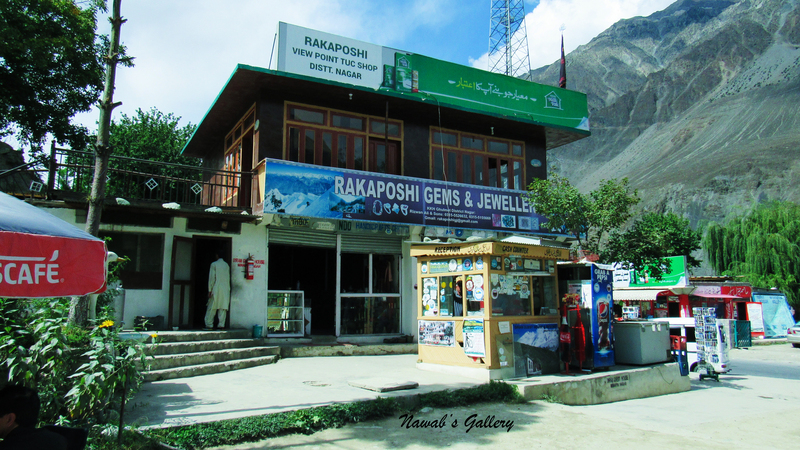 On our last visit to Karimabad, we found a teashop near this junction, but at this time it was closed, by asking the shopkeeper from the next shop we come to know that owner of the shop has some function in his family and the shop will open tomorrow. 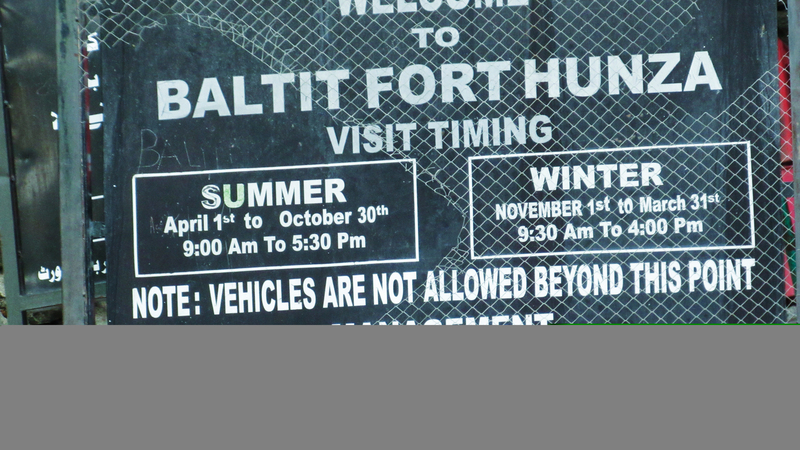 So now, we started to travel on the Baltit road that leads to the Baltit Fort. 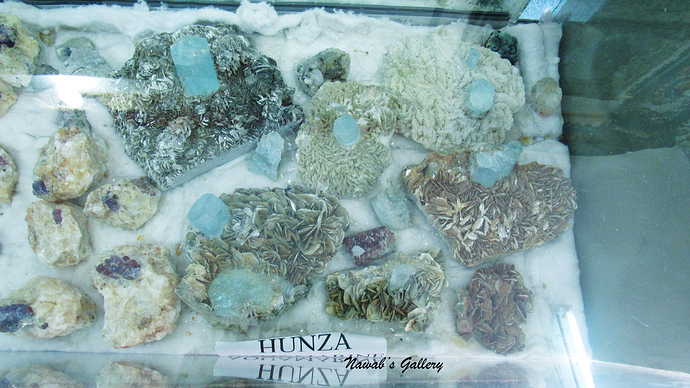 Hunza valley is rich in gems and precious stone there are many stores in Karimabad from where one can purchase these stones, suited according to their birth sign. 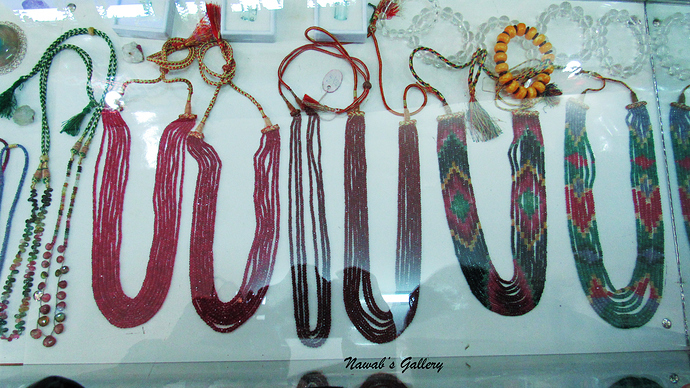 Thither are many types of gems and stones available in Karimabad, some of them are stones like Ruby, Emerald, Aqua Marine, Sapphire, Tiger Eye, Quartz, Turquoise, Lapis Lazuli, Carnelian (Aqiq), Tourmaline and many others. 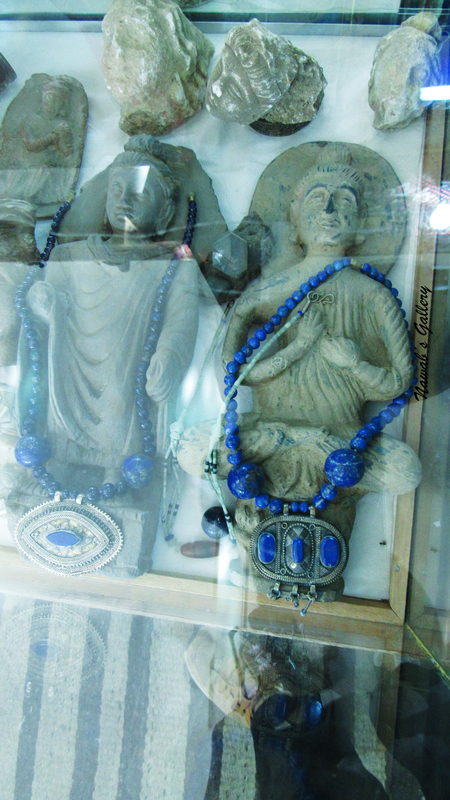 On the route to Baltit Fort, there is a store by the name “Mountain Art & Gems Gallery”, it is a store with the enormous collection of gems and stones, this shop’s proprietor is our nice friend, as we entered the shop he was so excited to see us and immediately come out from the shops counter to greet us. We sit for a long time at the shop having a chitchat and then decided to move forward toward Biltit Fort. 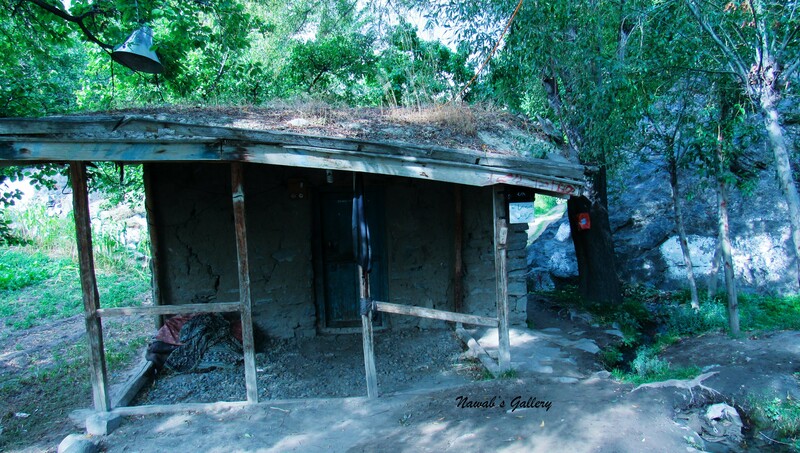 On the way before Polo ground, we saw a small shop where a woman is cooking some food, by asking she told us that she is making the famous food of Hunza by the name “Chapshooro”. Moreover, what is the difference in her food is that she cooks all her food with organic material like pure wheat flour and walnut oil. We placed an order and started chitchat with her while she cooks “Chopshooro” for us. She is a well-educated woman and during the talk, she told us that she has completed her master’s degree in “Food and Nutrition” from Japan. 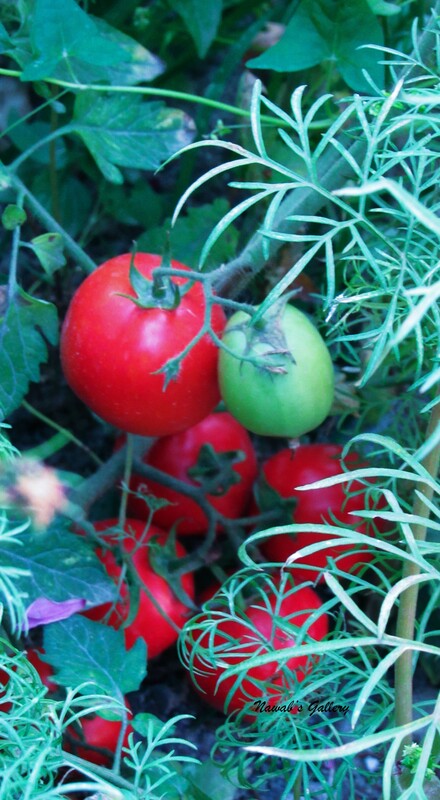 The aroma of “Chapsooro” was amazing and she severed it with homemade “ketchup” with the tomatoes grown on her own farm. Finishing the delicious “Chapsooro” we return to the hotel for a rest. We wake up at evening, in front of our room; there is a large balcony with table and chairs positioned around for sitting. 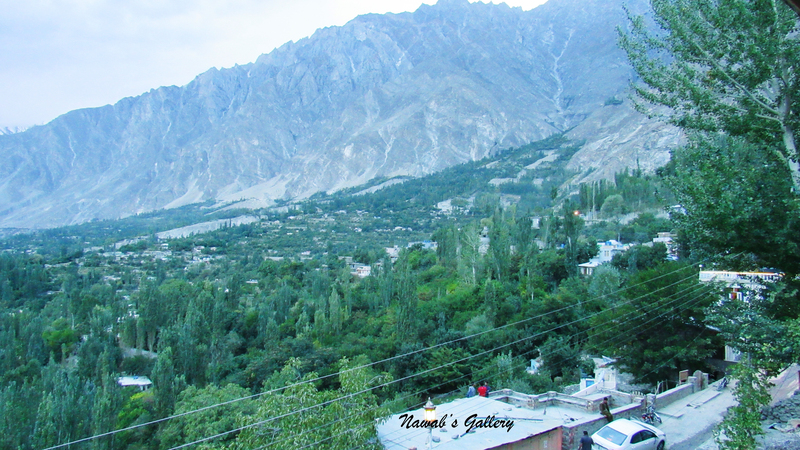 We sit on the balcony and placed an order for tea, in front of us is the most hypnotizing scenic view of lush green trees, the Hunza River and the magnificent Rakaposhi Mountain. 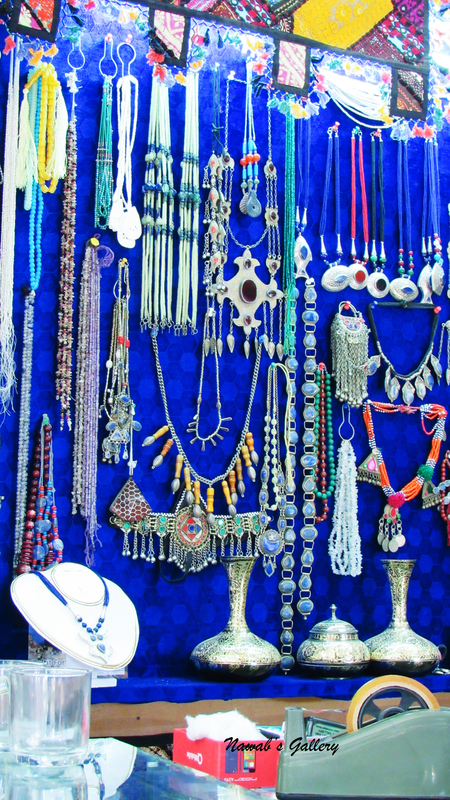 We again went downstairs and roamed around the Karimabad main Bazar until night. There were number foreign visitors around this place; they are from China, Korea, Britain, Germany, USA and many other countries. Roaming and shopping around the city and meeting different foreigners we arrive back to our room. We placed an order for the dinner that is of “Biryani (Rice)” and waited in the food area while the Biryani is prepared. After dinner, we return to our room and fell asleep after such a fabulous day, with a plan in hand for the coming day. 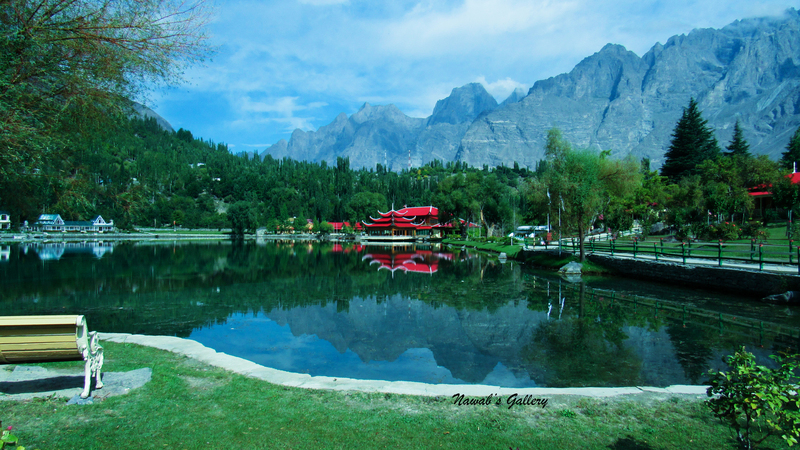 Kachura Lakes located nearly 35KM from Skardu city at an elevation of 8,200ft (2,500 meters) are two lakes, known as Upper Kachura and Lower Kachura Lake. Surrounded by forest and apricot trees this area is rich in flora. Last night we stayed at Ghazi Guest House in Upper Kachura, surrounded by tall trees and magnificent forest. The night was extremely silent and too dark and there was no light in the surrounding except for the one in our room and the shining stars, but the morning was bright and shining and the view outside the window was marvelous. 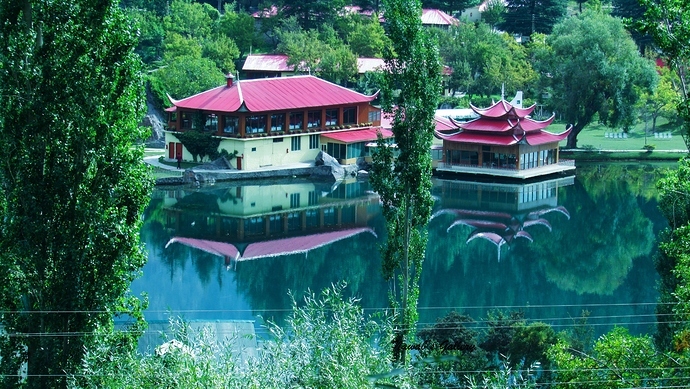 Today we have to reach Gilgit city while visiting Shangrila Resort at Lower Kachura. We walked toward the area where we parked our jeep while the hotel staff helped us to carry our luggage. Here we have to pay a parking fee of Rs 100 charged by the locals; this was the first and the last time in our whole trip that we were charged a parking fee. On the way, we passed some houses and a mosque that were built nearly 300 years ago and still exists. As soon as they place the luggage in the jeep our journey toward, Lower Kachura begins. After driving for few kilometers, we reached the most popular destination of this area, the Shangrila Resort. This place is extremely scenic and photographic and creates an astonishing atmosphere. 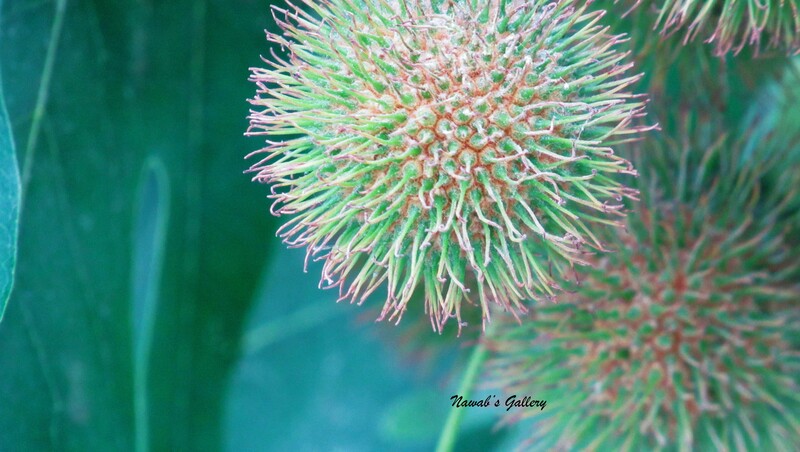 We roamed around the resort and captured many photographs before processing our journey toward our next destination. As our journey started our jeep’s driver informed us that we have to travel few KMs back toward Skardu, as he needs to fix tire of the jeep. We didn’t have the breakfast yet so we decided to have it there. Nearly after 20 minutes of the drive, we reached outskirts of Skardu city and stopped at a workshop for tire repair. There are some restaurants and shops at this place so we entered a restaurant for the breakfast but as it was almost 11 AM, there was no Parathas (Bread) left and we cannot have the breakfast. Therefore, we checked another restaurant and then another but received the same reply. Hence, we decided to buy a loaf of bread from a nearby bakery and ask the restaurant chef to make the omelet for us along with the tea, and this is after a long time we had a different breakfast during our journey. As our breakfast gets finished, so does the repair work of our jeep and our journey toward Gilgit city started again. 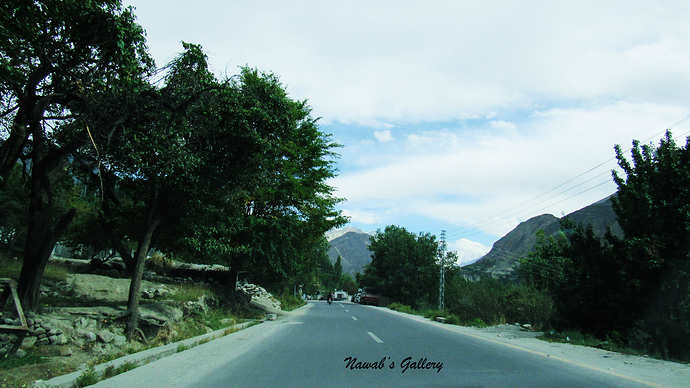 The road to Gilgit is a paved road and started with piles of trees on both sides of the road. It was a wonderful journey as after every few Kilometer the terrain changes creating a new scenery and surrounding. The journey that started with the piles of trees on both sides of the road is now changed and the road is now passing through lush green farms with some houses belonging to the local residents. Then after few Kilometers, the lush green farms changed into the barren land. 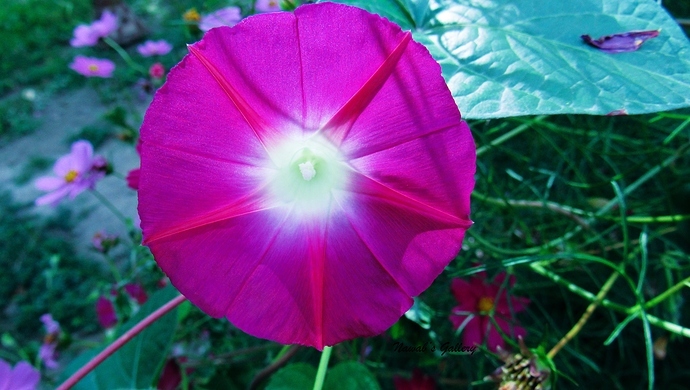 The sun was shining bright but the blowing wind creates a pleasant atmosphere. The road passes through different towns and villages and we stopped at some for a cup of tea. 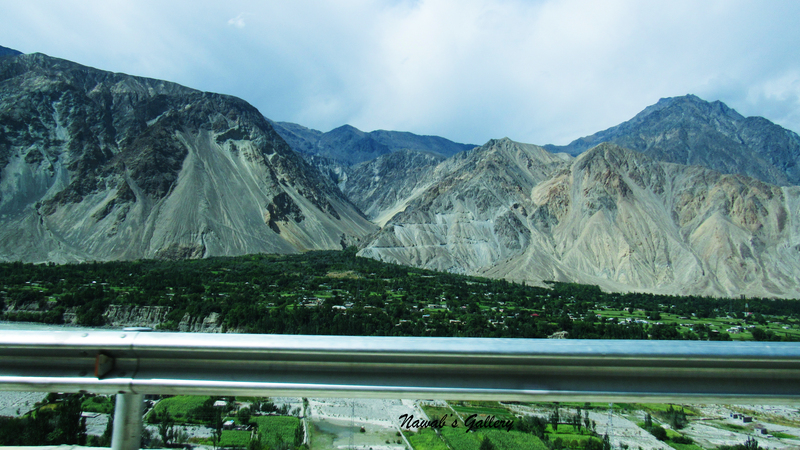 Capturing some photoshoots, we continued our journey toward Gilgit. 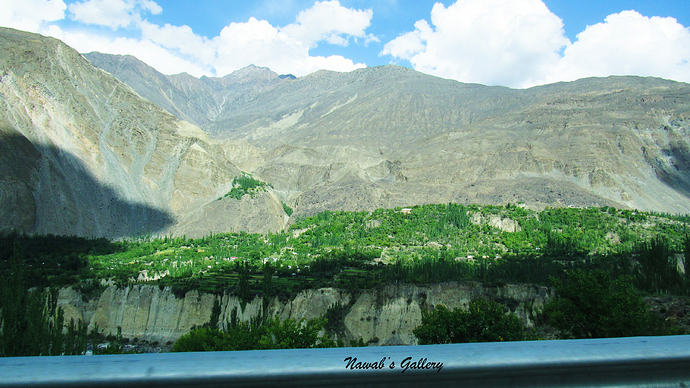 After traveling nearly halfway toward Gilgit the terrain changes again and now we are traveling on a road where on one side is a high rocky mountain and on the other side is a deep valley where River Indus is flowing with its full might. Also on the road, there are some water streams flowing down from above the mountain into the river Indus below. As the road is cut through the mountains thus at some spots the road is so narrow road with the just minimum margin for cars to cross each other, and if a truck comes buy then the other vehicle has to stop on the side of the mountain to give it the way. On the other side of the valley at different places, one can see a lush green terrain where hardworking residents of area grow vegetation and live in small houses build with woods from the forest. The people of this area emphasis very much on the education of their children and the children even have to walk many kilometers daily to the visit the school. Far on the mountain, one can also see many caves dug in at some distance from each other; our jeep driver told us that the people of this area in search of precious stones and gems dug these caves. Traveling on the road our jeep suddenly stopped and our driver pointed out that there is a land sliding happing up on the mountain and we have to wait until it stops, as it is very dangerous if this land sliding turns into a large one and can block the road for hours. This area is very prone to land sliding and every year land sliding destroys a large area of road. 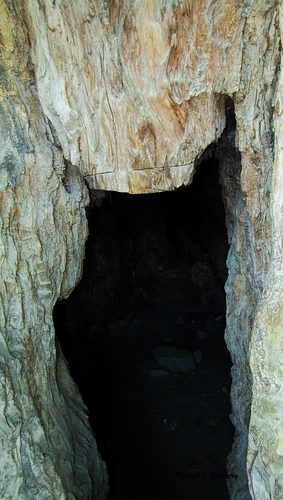 However, to our luck, the land sliding stops after few minutes and carefully we started our journey again. Near to Gilgit city, we stopped at a restaurant for a cup of tea and from that spot, the magnificent Rakaposhi is visible with it snow covered peak and stunning slope. 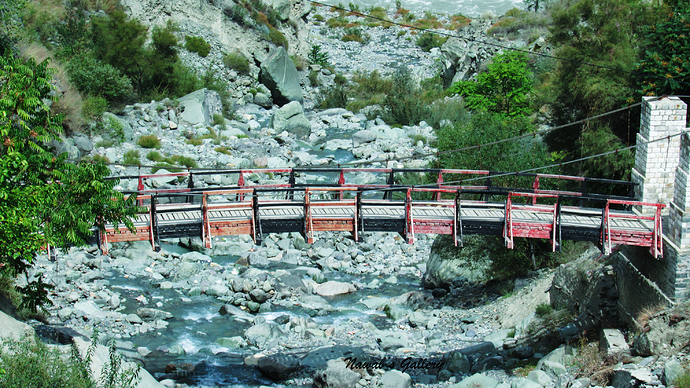 As our journey started again we are getting closer and closer to Gilgit city and before joining the famous Karakoram Highway that connects Pakistan with neighboring China, we crossed the famous hanging bridge build over River Gilgit, this bridge is considered one of the oldest bridge in this region and it made of steel rods and wooden floor. Only one vehicle can cross the bridge at a time and when we reach there, a truck was already crossing the bridge so we stop for it to cross and then was our turn. Nearby the government is constructing a new concrete bridge that will replace this old bridge. Now we were traveling on the 8th wonder of the world the Karakoram Highway toward Gilgit city. 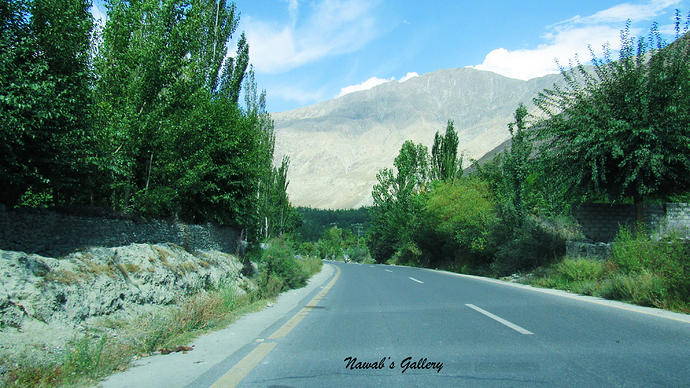 This is a paved well-maintained road with beautiful sceneries all around. After nearly 6 hours of traveling, we reached the Gilgit city and stop at Taj Hotel & Restaurant near NLI Market, the same hotel where we stayed on our last trip to Hunza and Khunjerab. At this place, we also let go our jeep that we have booked from Raikot Bridge when we returned from our trek of Fairy Meadows. We place our luggage in the room and placed an order for the dinner. This hotel has a dining area but as we were too much tired because of this long journey, we opt to have dinner in our room. Tomorrow morning we will be traveling to our most beloved place Karimabad, Hunza before starting return journey toward our home. 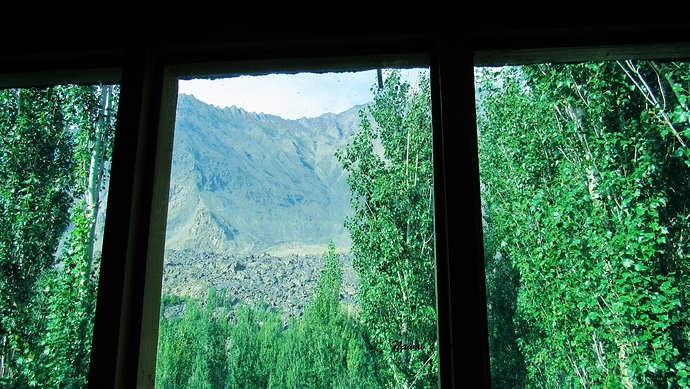 We woke up early in the morning at the most stunning place of this region, the Kaplu, where we reached yesterday and after touring different places of this marvelous valley, we spend our night at Karakorum Lounges. 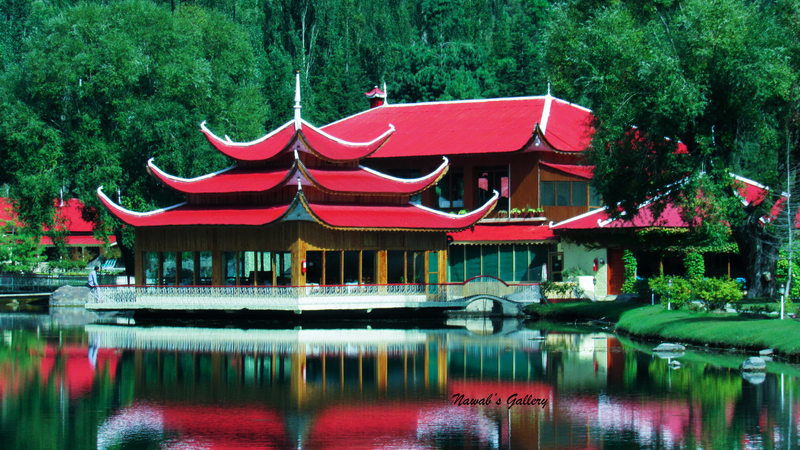 Karakorum Lounges is a great place to stay and is at a marvelous location too. It is a large hotel with both luxurious and budget rooms. Rooms are well maintained and equipped with television and Wi-Fi. With comfortable beds, neat and clean environment this hotel meets all the benchmarks. 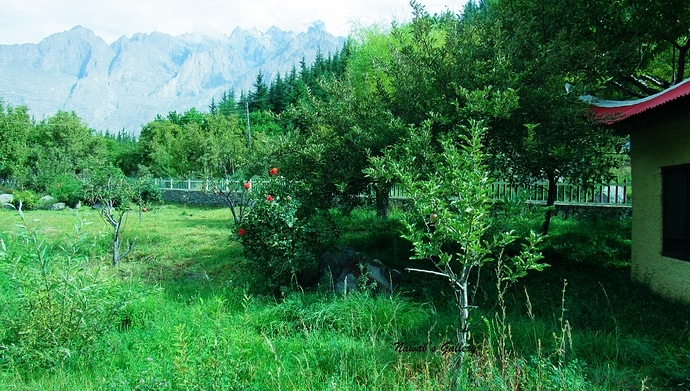 Surrounded by famous mountains and the river Shyok flows nearby. Last night we had a yummylicious dinner prepared by the hotel staff and for the morning, we have placed an order for breakfast. Thither is a large garden in front of the hotel and while we were waiting for breakfast, we moved outside to roam around the garden. While we were roaming around and capturing photographs a person from the hotel approached us and told us that, we can have the marvelous view of the surrounding from the top of the roof. Then we moved upstairs to the roof, the scene from the roof was extremely tempting. 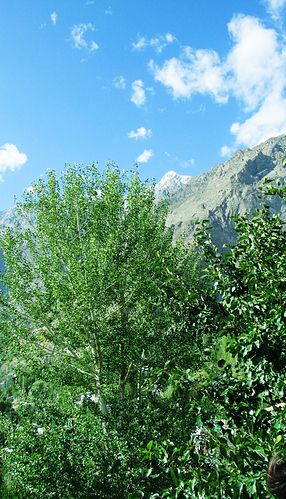 In front of us, we can see the magnificent River Shyok and the mighty mountains surrounding the Khaplu city. The person from the hotel told us that we are very near to “Line of Control” a temporary border between Pakistan and India and the famous places of Siachin Glacier, Kargil, Masherbrum and Hushey Valley are just an hour ride from here. 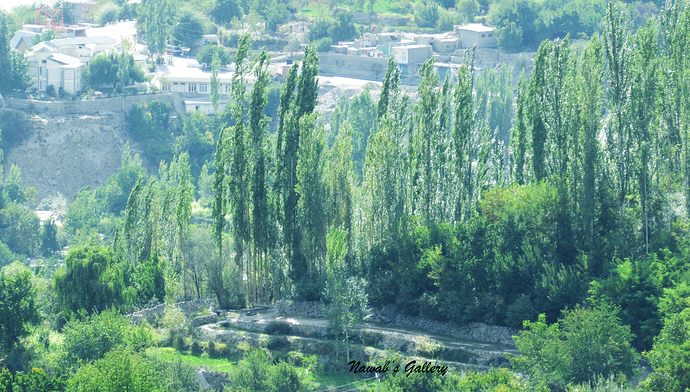 Concluding the mesmerizing view of the area, we went downstairs for the breakfast and then started our journey toward our next destination, The Shigar Valley and Fort. Before we proceed our journey toward Shigar we had a plan to visit Masherbrum and Siachen View Point, but at Sormo we were stopped by the security person there and was told that we would need a written permission from the DC Office to visit Masherbrum and Siachen View Point, as this is a high-security area that goes till Siachen. As we did not have adequate time to get back to Kaplu and bring the permission letter, we decided to return and proceed our journey toward the Shigar Valley. 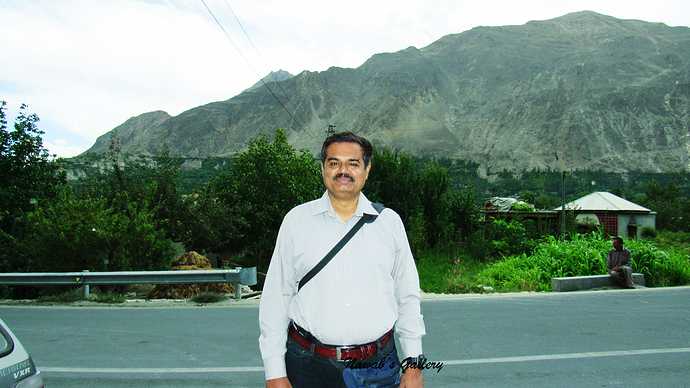 We travel on the same beautiful road by which we reached Kaplu yesterday from Skardu. The road we were travelling passes through the stunning valley, crosses rivers and water streams with the sight of mighty mountains in the surrounding. 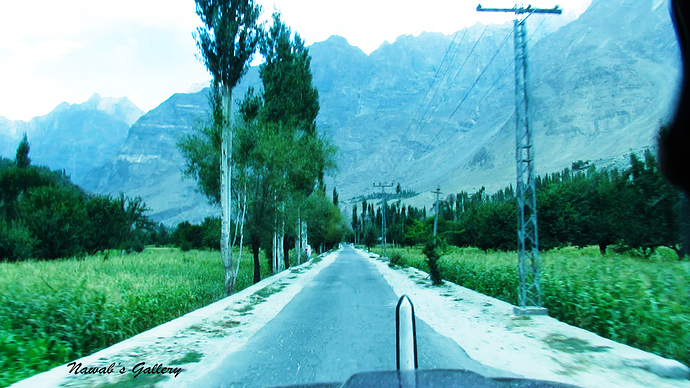 Nearly 50 KM before Skardu there is a road going toward the Shigar Valley. 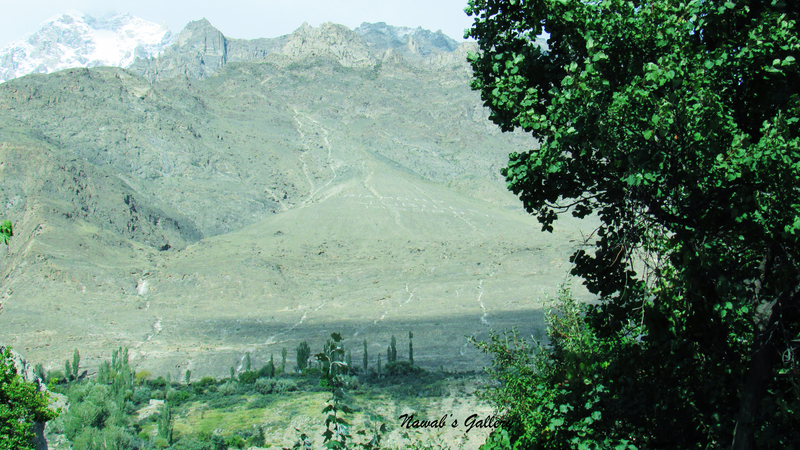 We took the right turn and started travelling toward Shigar, suddenly the scenery changes and instead of lush green grounds and trees, barren desert surrounds us with white sand spread all over. 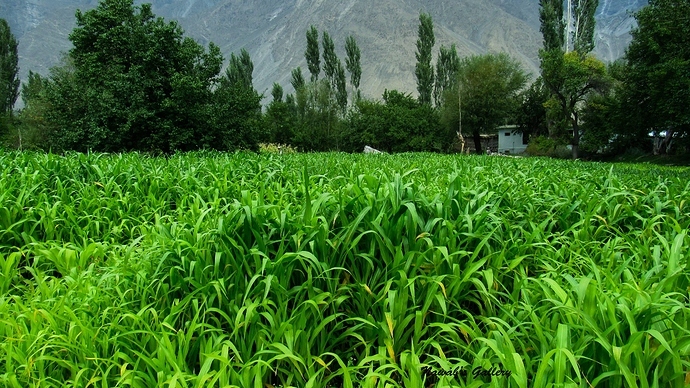 This is Shigar Desert part of Katpan Desert, the world’s highest cold desert. 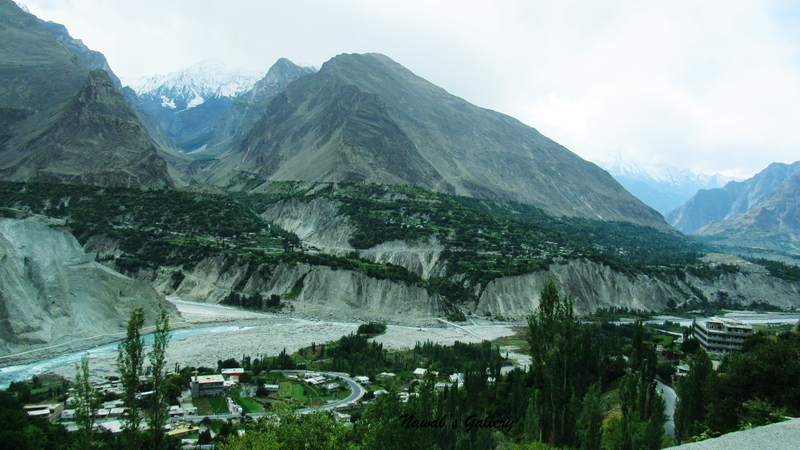 Situated at an elevation of about 7,303 ft. (2,226 meters), Katpana is one of the most beautiful tourist attractions of Gilgit-Baltistan. With a temperature range from 27 °C during summer and -10 °C during winters, it is one of the highest cold deserts in the world. The sand dunes surrounded by snow-covered mountains make this place a mesmerizing and majestic place to visit. 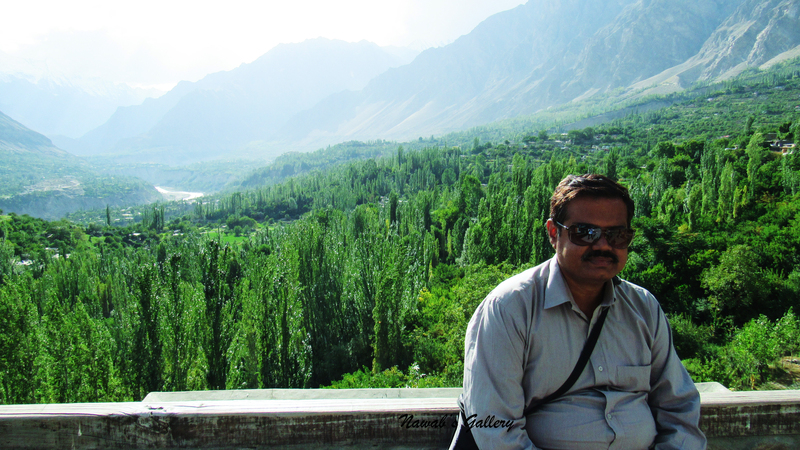 Stopped for some photo shots in the desert, we travel nearly for half an hour before reaching Shigar Viewpoint. We stop at the Shigar View Point for some photographs before proceeding toward Shigar Fort. 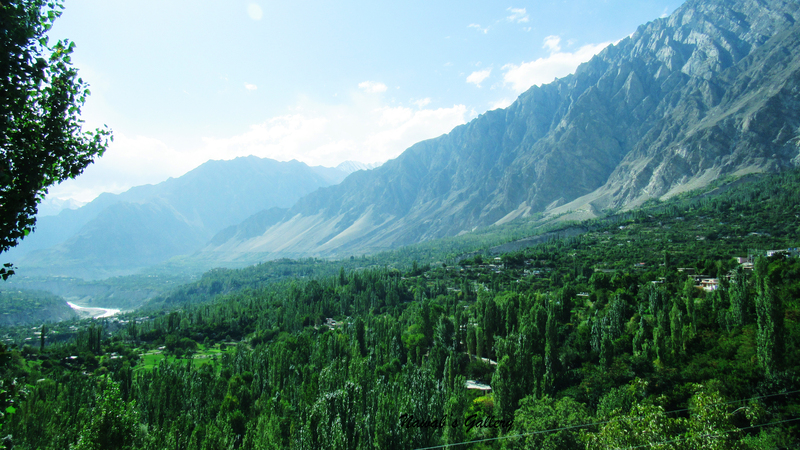 The view of Shigar Valley from this point is marvelous with Shigar Desert on one side, lush green Shigar Valley on the other and the Shigar River flows in between. 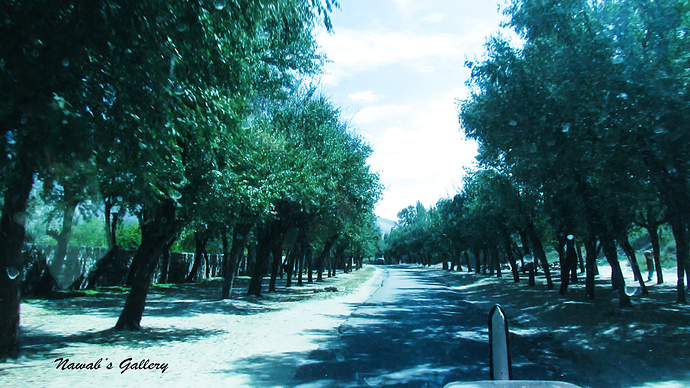 Embracing the beauty of the location, we travelled toward Shigar Fort, crossing the Shigar town we reached Shigar Fort. 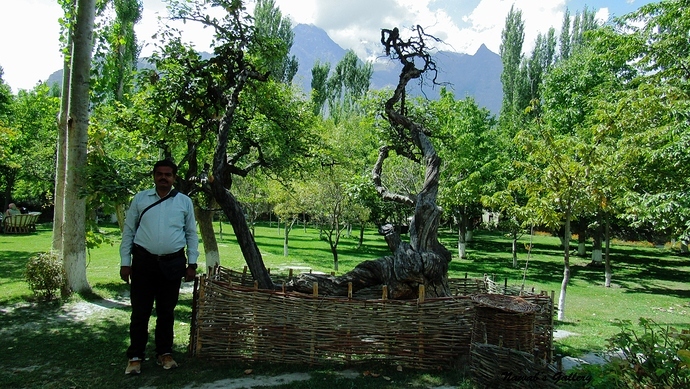 Shigar Fort, now converted to Serena Shigar Hotel, was built in the 17th century by the Raja of Amacha and means the “Fort of Rock”. The fort houses a museum and represents the cultural heritage of Shigar Valley. Paying the entry fee for the fort, we entered and went exploring the magnificent building. Inside the fort, the equipment, utensils and the items used by the occupant of the fort are kept along the exhibit. Completing the tour of the building, we came in the Baradari, it is a square shaped building surrounded by running water steam and a beautiful garden. 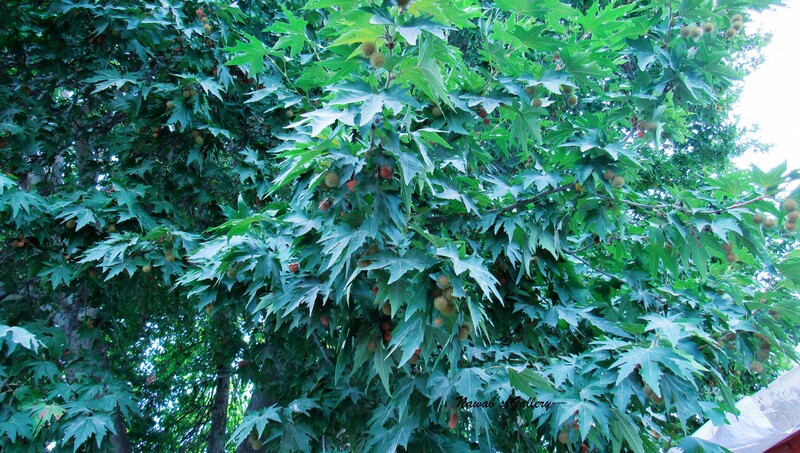 In the garden, there is a 400-year-old Chinar (Oriental Plane) Tree, the tree holds a hollow body that catches fire after every 300 years. 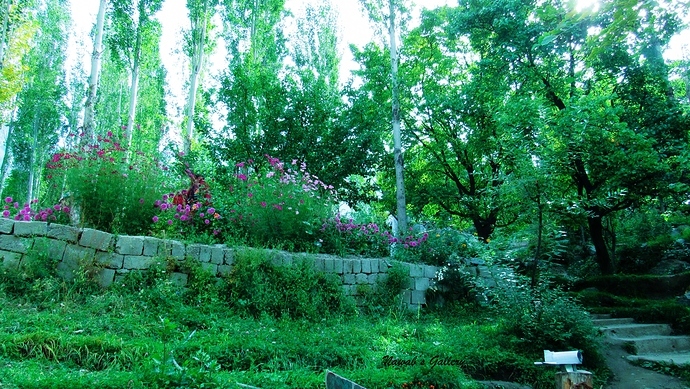 There is likewise a large garden next to the fortress building, ending up the trip of Baradari we went into the garden. 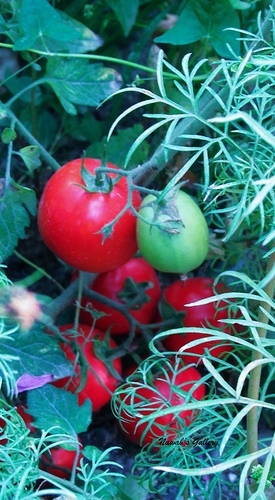 The garden was well maintained with sitting arrangements at different places and has a restaurant that serves snacks, tea, coffee, lunch and dinner to the visitors as well as to those who resides at Sarena Hotel. We roamed around the garden captured some photographs and then return to our jeep. Our next destination was Kachura near Skardu but before proceeding toward Skardu we decided to visit the Shigar Town for a cup of tea. We opt Hotel River View Shigar, it is in the middle of the Shigar Town and a water stream flows right next to the hotel lawn. 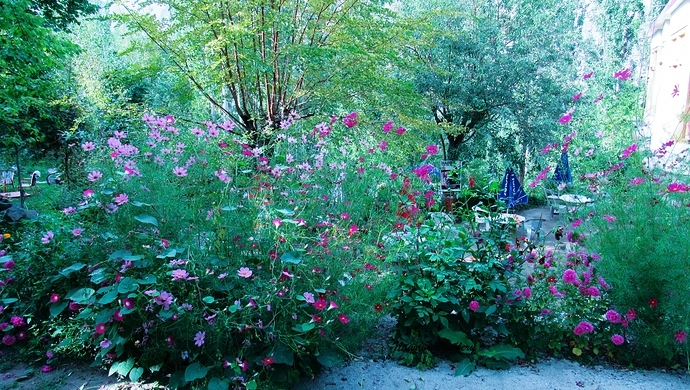 We sit in the garden while enjoying the tea; it was a very pleasant atmosphere with a good view of the surrounding. Finishing the tea our journey toward Kachura started again. After driving for nearly 2 hours, we reach Kachura. Kachura has two parts the Upper Kachura and Lower Kachure, we decided to spend the night at Upper Kachura and then visit Lower Kachura in the morning. Upper Kachura is a spectacular place, our jeep stops at a location where there are farms all around with some houses belonging to the locals. After parking jeep at this place, we started to walk toward the Upper Kachura Lake. 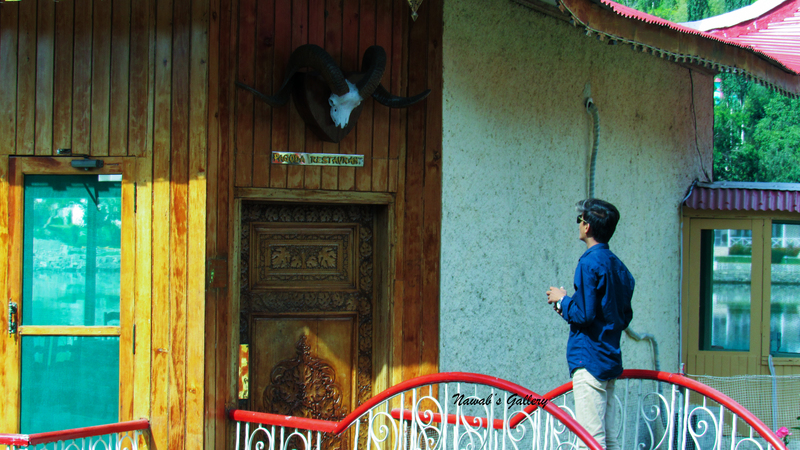 It was a ten minutes’ walk before we reach a hotel on the way to Kachura Lake, Ghazi Guest House, we booked a room for the night at that hotel as it was at a marvelous place surrounded by lush green forest and very near to the lake. 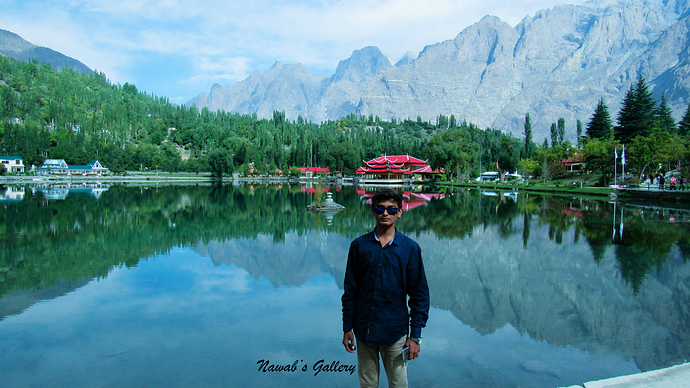 From there we walked toward the lake, after climbing down few steps we were standing in front of a vast lake filled with stunning blue color water, the same color that we witnessed at Attabad Lake in Hunza. The semblance of water is amazingly beautiful, the water is so clear that the bed of the lake is clearly visible, this smoothness of water makes it appear like a big mirror in which one can clearly see the reflection of the surrounding mountains. The calmness of the surrounding creates such a spiritual phenomenon that one will find his body so light that makes you feel like being adrift in the air. At that place, a boat was available to rent for those who wish to cruise the lake. We hired the boat to sail around the lake, the lake surrounded by lush green forest and the snow-covered mountains create a magnificent scenery. Finishing the mesmerizing boat ride, we return to the place where we have parked our jeep because at that place we saw a restaurant, One Season Resturant, and we had to have the dinner. 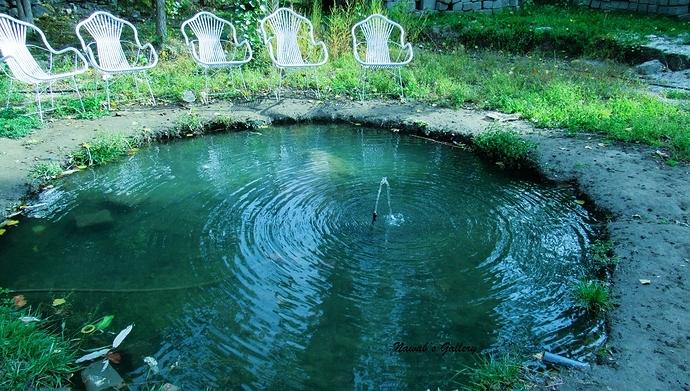 We ordered Trout fish and fried chicken for the dinner, as we waited for the dinner we passed our time by sitting around and enjoying the beauty of the area. The dinner was well prepared and delicious; finishing the dinner, we started to walk toward the hotel. It was too dark, the darkness we have never seen in our life. 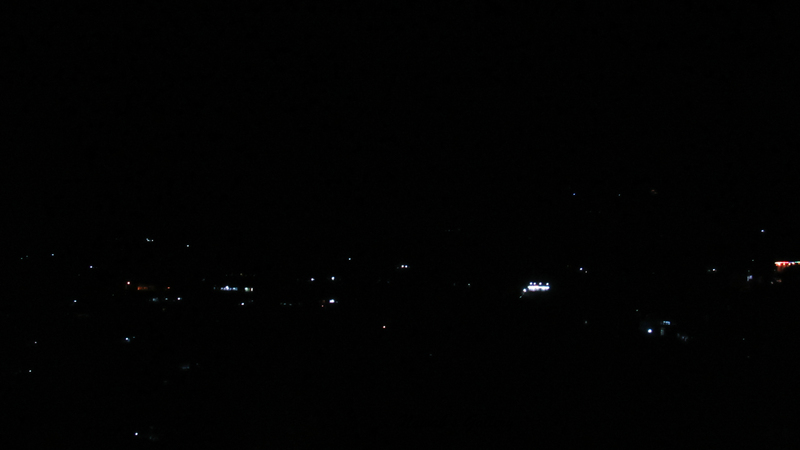 Therefore, we stop for a while for stargazing. We have never experienced stargazing as we experience it at this place away from the bright lights. Looking at different constellations and searching for shooting stars was a great experience. There was no moon in the sky and we were unable to see the path to the hotel but as we have torch we were able to reach our already booked hotel for a deep sleep. 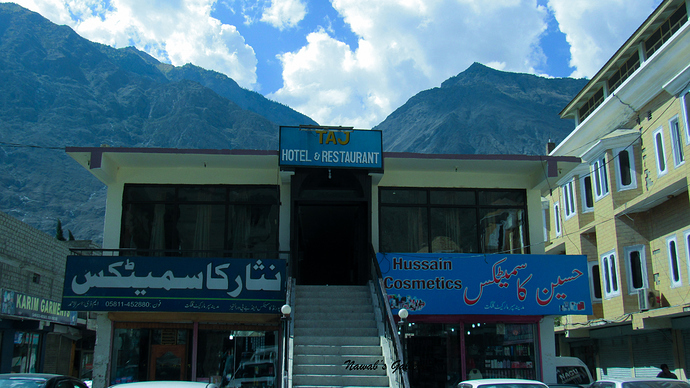 Baltistan Continental is an excellent hotel with courteous and friendly staff. It is located on the Hameed Garha Road, near Commissioner Office Skardu. It is more as an apartment than a hotel. The area where we stayed has three bedrooms each with attached bathroom. Thither is a dining area and a kitchen for those who are interested in self-cooking. 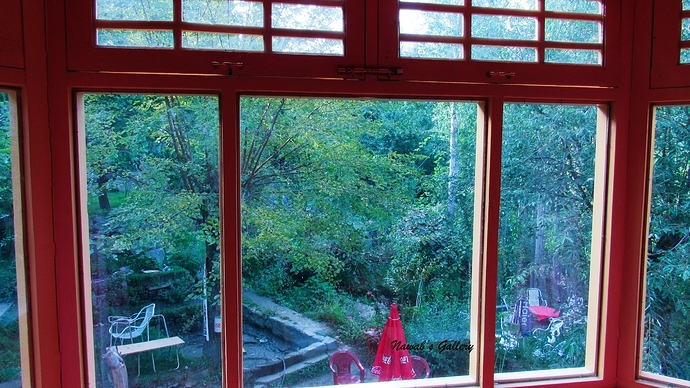 There likewise is a balcony in front where one can sit and savor the eve or the morning tea. 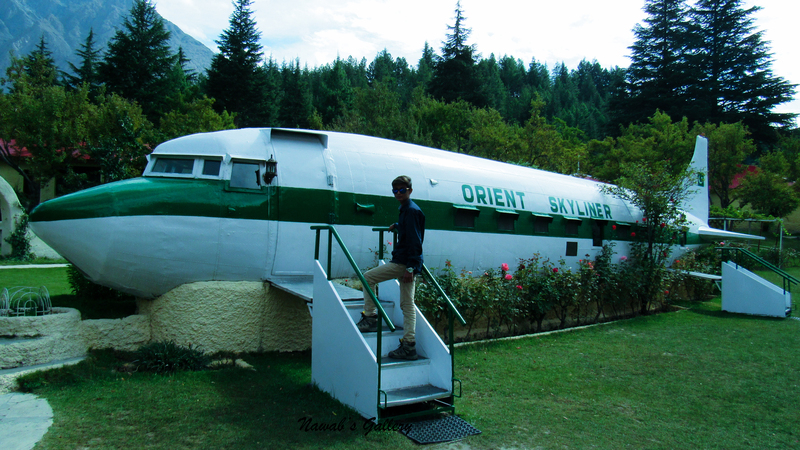 Last evening we reached Skardu and stayed at Baltistan Continental Hotel. We wake up fresh and energetic as the hotel was very comfortable and we had a good night’s sleep. After the delectable breakfast prepared by the hotel staff, we placed our luggage in the jeep and began our journey toward our todays destination, Kaplu. 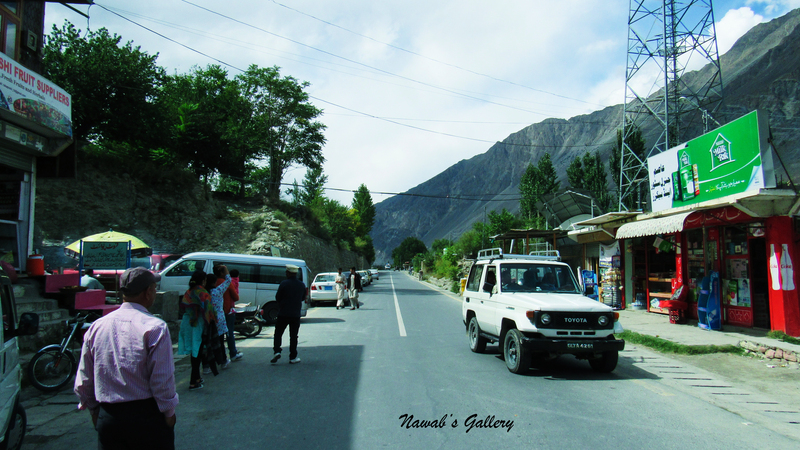 We went through the Skardu city and then join the Kargil-Skardu road. The road is stunning, passing through beautiful towns along both sides of the road, with the panorama of nearby mountains. 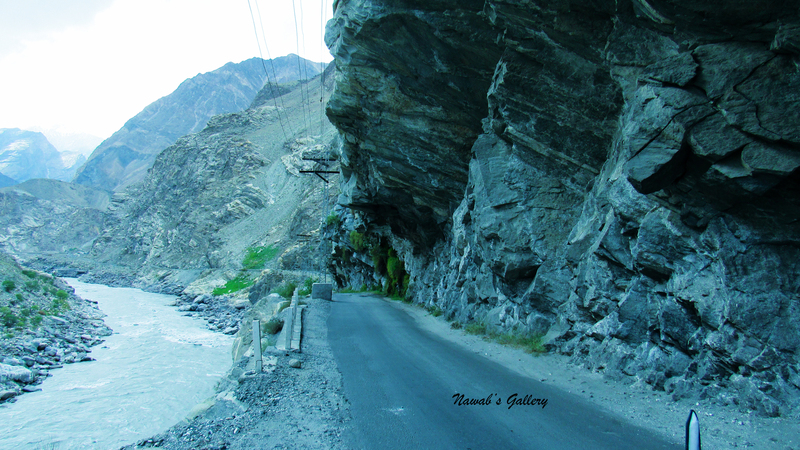 After travelling, some distance the river Indus started flowing in parallel to the route. Along the way to Kaplu there is a famous waterfall by the name Manthoka and it was also part of our itinerary to visit Manthoka before going to Kaplu. At the junction of the River Indus and River Shyok there are two roads the Kargil-Skardu road that is going toward Manthoka Waterfall and the Khaplu-Skardu road toward Khaplu. 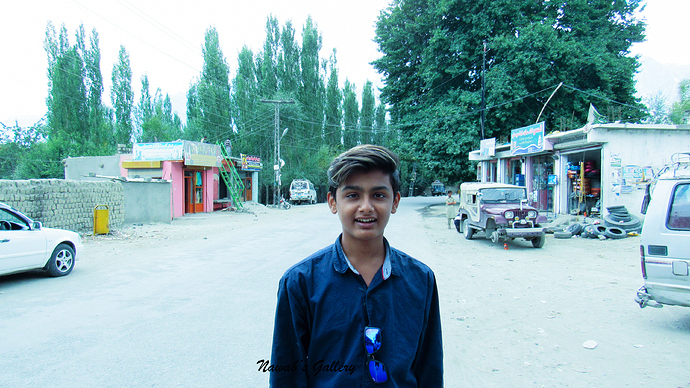 Our first destination is Manthoka so we continued our journey on the Kargil-Skardu road. This is a single paved road passing through extremely beautiful surrounding. 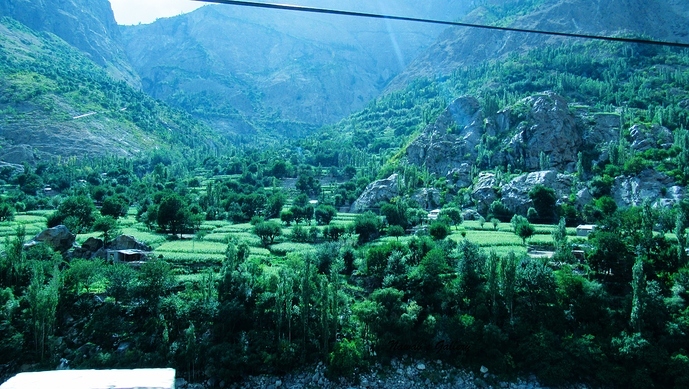 Along the road, there are Millat farms, cold-water streams and the villages that make this a marvelous journey. On the road to Manthoka there is a check post where tourists have to provide their identity and enter their details in the register. The security person at this check post told us that this road leads to the Line of Control and if we travel two more hours after Manthoka we will reach another marvelous waterfall by the name Khamosh. However, as we have to reach Kaplu we do not have enough time to visit Khamosh so we just went until Manthoka Waterfall. With a height of about 180 feet, Manthoka Waterfall, considered one of the highest waterfalls of Pakistan. 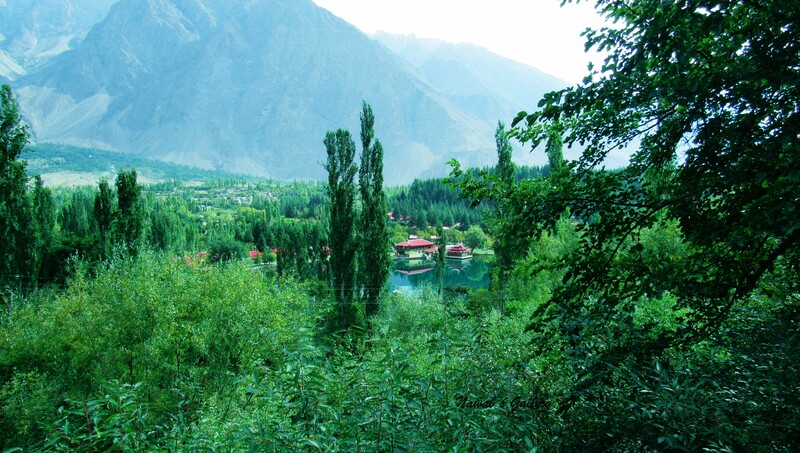 Located 40 KM from Skardu city in Kharmang valley it is a majestic place featuring flourishing green areas and fresh streams and clear water flowing down from above the mountain, making it an ideal place for camping and fishing. At this place is a restaurant with both inside and outside sitting arrangements. We opt to sit in the outer area next to the water stream near the falls. We put the order for fries and tea and roam round the stunning area capturing photographs and dipping hands in cold-water flow. The water stream is so clear that one can see the riverbed and the stones in the water. There were some other tourists visiting this area as well, some roaming around, and some sitting by the water stream and one of them is busy with fishing. After wandering around, we got inside the restaurant to capture some more photos. The restaurant was well kept and clean with courteous staff, serving snacks and tea. The surrounding of Manthoka was so much beautiful that we were having second thoughts in leaving this place, only as we have to reach Kaplu so we hopped back in the jeep and began our journey toward Kaplu. For Kaplu we have to travel back on same stunning route by which we reach Manthoka. 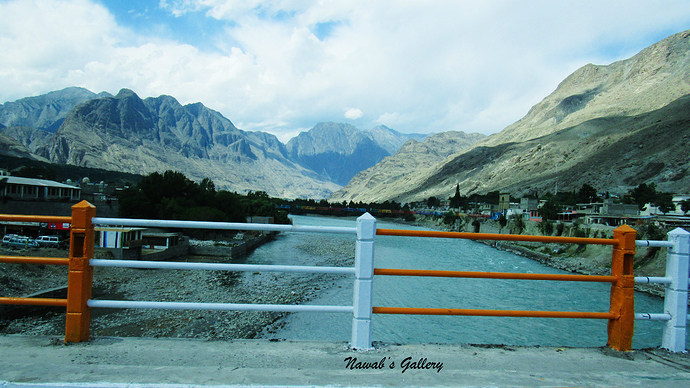 We go until the confluence of River Indus and River Shyok on Kargil-Skaru road and subsequently passing over the bridge over River Indus, we took Kaplu-Skardu road. We stop on the other side of the bridge for security check and capture some photographs before starting our journey toward Kaplu again. 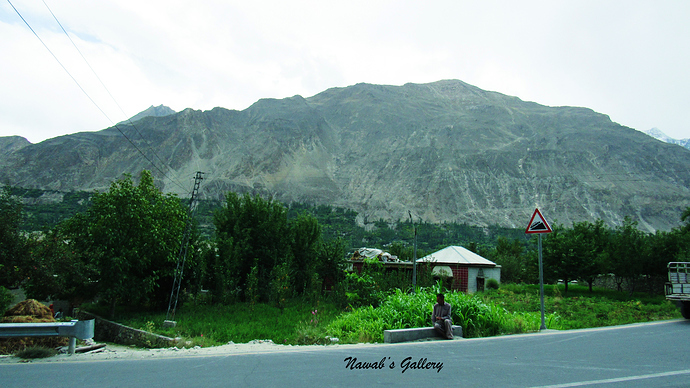 Kaplu the administrative capital of the Ghanche District is located in the eastern part of Baltistan. At an elevation of 2,600 ms (8,500 ft), it is a wondrous valley located at the confluence of the Indus and the Shyok Rivers. 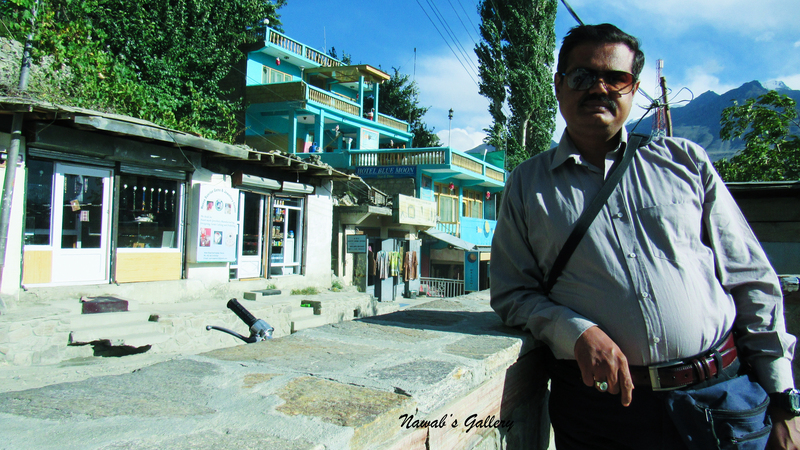 Passing through the main town of Kaplu the River Shyok is a tributary of River Indus and is an ancient trade route to Ladakh. At a distance of 103 kilometers (64 miles) from Skardu and two hours drive by jeep, it was the second-largest kingdom in old Baltistan of the Yabgo dynasty. Nearby in the Hush Valley lies many famous mountains, such as Masherbrum, K-6, K-7, Sherpi Kangh, Sia Kangri, Saltoro Kangri and Siachen. 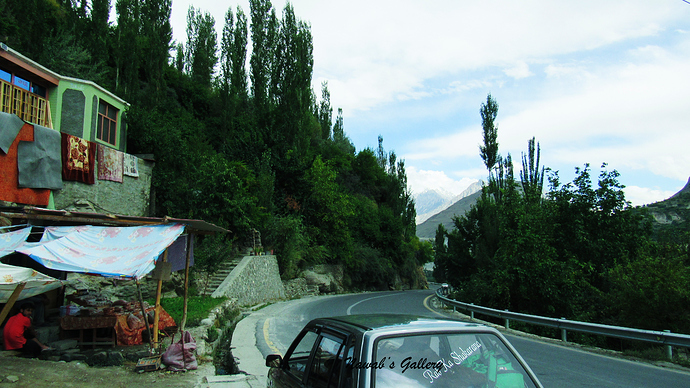 The road toward Khaplu has different terrains; it has plain barren grounds, hill areas, and snow-covered mountains, farms and small towns. While moving on this road, there is, a spot where there are trees planted on both sides of the road making it the most beautiful part of this route. We reached Kaplu after about 2 hours of drive from Manthoka, our plan was to go directly to Mashabram Viewpoint. However, the people at Kaplu told us that it is of no use to go there as the area is being covered with clouds and will not be able to view any of the mountain peaks there, so we decided to go to Kaplu Fort. Travelling toward Kaplu Fort, we saw too many cars and jeeps parked along the road by asking the people there we come to know that a polo match is going-on at the polo ground near Kaplu Fort and the cars and jeeps belongs to the visits of the match. Since we do not have any interest in watching the match so we went directly to the Fort. 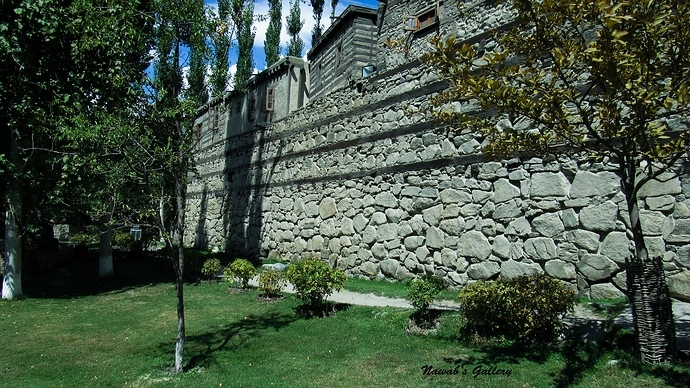 As per wikipedia, Khaplu Palace, locally known as Yabgo Khar (meaning “The fort on the roof”), is an old fort located in Khaplu, in the Gilgit-Baltistan region of northern Pakistan. The palace, considered an architectural heritage and a tourist attraction, it was built in the mid-19th century, replacing an earlier fort located nearby. 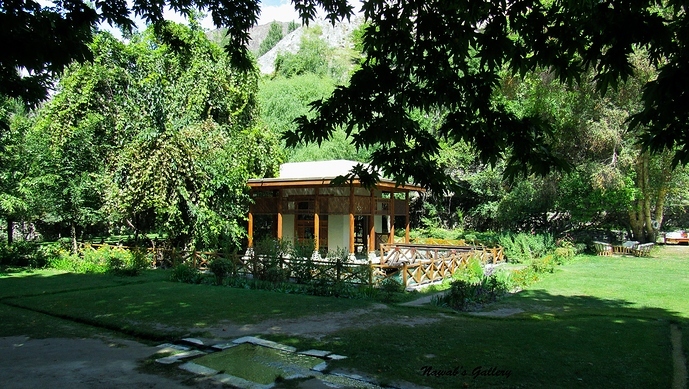 It served as a royal residence for the Raja of Khaplu. From 2005 to 2011, the palace, having earlier stood in vulnerable conditions, underwent a restoration project carried out by the Aga Khan Trust for Culture under the Aga Khan Historic Cities Program. 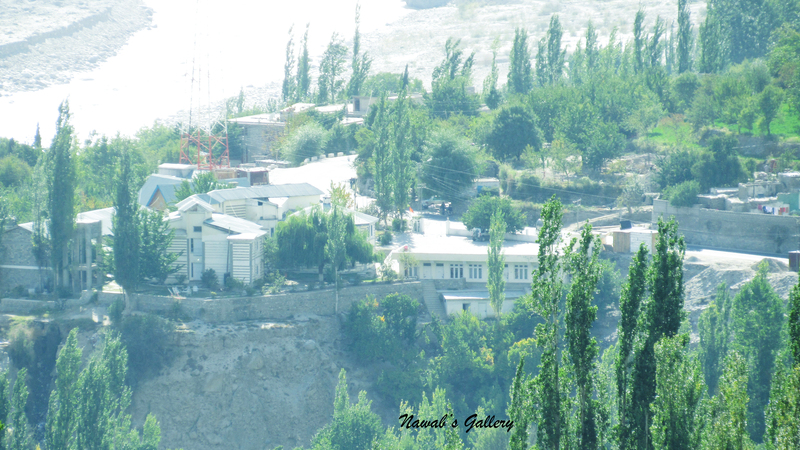 The palace now houses a hotel operated by Serena and a museum depicting the history and culture of Baltistan. 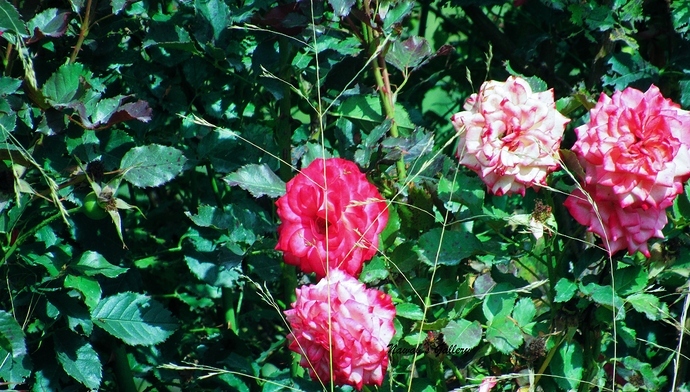 Thither is a fee to enter the Kaplu Fort; the tour began with a beautiful garden at the ingress of the fort and a track created with stones lead to the Fort Building. As shortly, as we enter the Fort a nice looking person approaches us and told us that he will steer us into the Fort and that is setting off our tour of the fortress. Starting with the history of the fort the guide took us inside the fort and explaining in detail nearly every part of the fort. The fort houses the furniture, the dresses, the tools, the utensils and the documents belonging to the occupants of the fort. Completing the tour, the guide at the fort inform us that there is nearly a 300 years old mosque in this area and as his duty at the fort is over he can take us to the mosque. We accepted his offer and hopped into the jeep. Driving through the city, we reach a very beautiful and stunning place where there is a village with houses built with wood and stones on one side of the road and the high mountain on the other side of the road. The place where our jeep stopped, there are steps going upwards on the mountain and we started climbing those steps. Climbing nearly half the stairs we realize that the mosque is too high above the mountain and we will not be able to make it to the mosque, as we were completely exhausted and can climb no more. However, we found ourselves standing at the spot from where we can observe the stunning view of Kaplu. Snow-covered Mountains and the beautiful valley of Kaplu along with the marvelous Skoyk River, flowing at a distance, is clearly visible from this point. Capturing some photographs of the Imperial Valley, we climbed back down to our jeep. Our next destination is the famous Chaqchan Mosque. Established in 1370 (A.D) Masjid Chqchan or Chqchan Mosque was built by Mir Sayyid Ali Hamadan and is one of the earliest mosques in this area. Chqchan Mosque means Miraculous Mosque, and constructed similar to the Roman Opus craticum that is quite suitable and effective because of harsh winter season of the region. As the tour of the beautiful mosque ends so does our itinerary for today and then we drive toward our hotel. 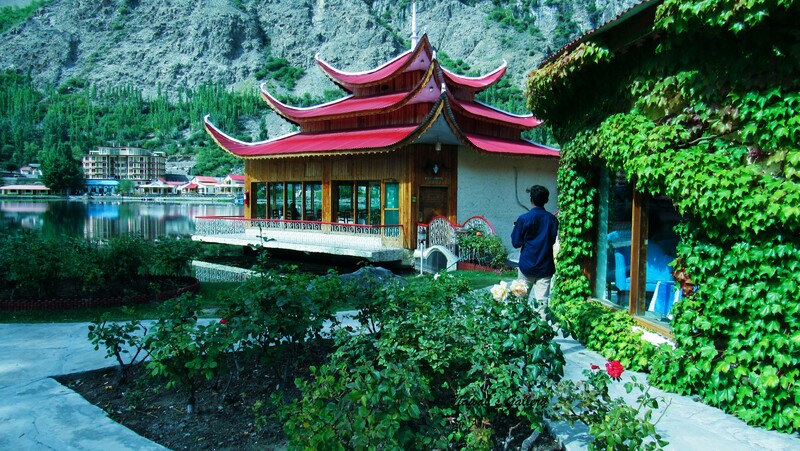 We selected Karakoram Lodge for our night stay and as soon as we reached the hotel, we place an order for the dinner, as we were feeling overly hungry. 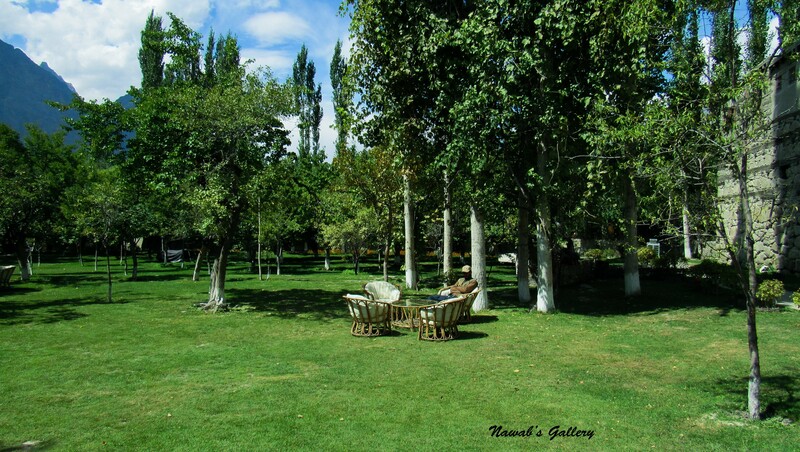 While they prepare dinner, we went into our room to unpack our luggage and then got out in the stunning garden of the Karakorum Lodge. Firstly, the delicious soup was served and then the delicious Biryani (Rice) is brought to the table. Finishing the dinner, we went into our room for a night’s sleep, so that we can get up early in the morning to travel to our next destination of Shigar Valley. Deosai, in local language, means “The Land of Giants” is one of the highest plateaus in the world at an elevation of 4,114 meters (13,497 ft) above sea level. Covering an area of 3,000 square kilometers (1,200 sq mi) it is access able from both Astore and Skardu side. Covered by sweeps of wildflowers and a wide variety of butterflies, Deosai is the second highest plateau in the world and is only accessible in the summer. In winters it is completely covered with snow. With large inhabitant of Himalayan brown bear and its other habitat like Himalayan ibex, red fox, golden marmot, gray wolf, the Ladakh Urial, the snow leopard, Deosia is declared as a National Park in 1993. The night at Gorikot, where we stayed was not that comfortable, the hotel was not as per standard and was smelly too, but there was no other option for us as we were too tired and don’t have enough time at night to search for another hotel. 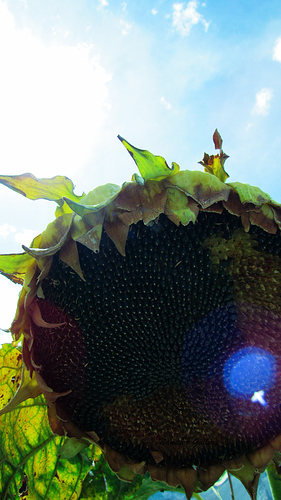 It was too cold at Grikot in the night, but in the morning the sun was shining. Today is going to be a long day travel as we will be entering Deosia from the Astore side and will travel to Skardu after crossing the Deosai Plateau. We placed the order for breakfast and started collecting our luggage and place it in the jeep. The breakfast was ready within half an hour and we went into the dining area for the breakfast. Same as the dinner the breakfast was very delicious too. Completing the breakfast, we bought some snacks and juice from the nearby store and hopped into the jeep. Our journey toward the Deosai begins and we were travelling on a paved road in the same direction in which we travelled toward the Rupal and Tarshring. The route toward Chillum Chowki, the entrance post of Deosai from Astore is marvelous. There were many small towns along the route, and the water stream with crystal clear water is flowing in parallel with the road. 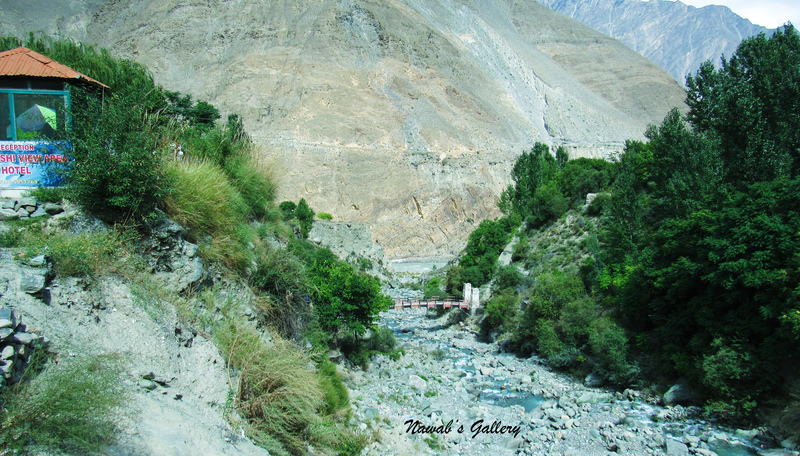 Chilum Chowki is nearly 52KM from Astore and travelling on this marvelous route with stops for some photo shoots of some places we reached Chillum Chowki in nearly 2 hours. At the altitude of 3800 meters Chillum Chowki is the entry point for Minimarg and Deosai National Park. Minimarg with its multistory wooden cottages, fertile and leveled field with high lush green mountains leave a lasting impression on the mind. Known for heavily forested Domel, magnificent Rainbow Lake, Chota Deosai and the famous Burzil Pass is an excellent tourist destination. 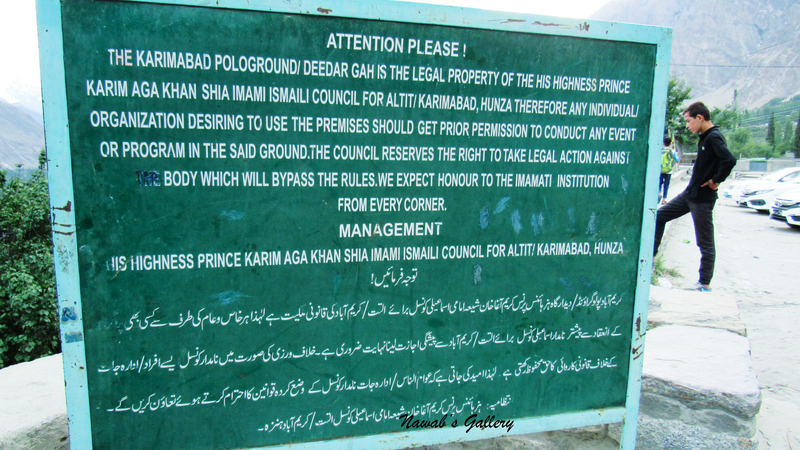 But entry to Minimarg is only allowed through special army permission from Islamabad. At Chillum Chowki there is an army check post, as there is an army camp at this. There are also some restaurants, small tuck shops, car workshops and hotels for those how wants to spend the night at Chillum Chowki. While our jeep driver stops to fix a tire, we entered a nearby restaurant for a cup of tea. There were some army persons having tea at this restaurant we had a small chit-chat with them and roamed around while waiting for the tea. Fixing the tire of the jeep our driver joins us for the tea and finishing the tea our journey toward Deosai National Park started again. The entry to the Deosai requires a payment of a small fee at the Wild Life Office, the forest officer at that place also provides us some brochure with instruction and information regarding the park and its habitats along with a garbage bag. Paying the fee and collecting the receipt, we have now entered the long awaited Deosai plain. The entry to the Deosai is stunning itself with green field all around with the view of beautiful mountains at a distance. The sun was shining bright but the weather at Deosai is very cold as ice chilled breeze coming from the nearby snow covered mountains is blowing at the plain. After travelling for nearly 1 hour we stopped at a small hilltop, from this hilltop the famous heart-shaped Sheosar Lake is clearly visible creating a breathtaking view. Sheosar Lake meaning Blind Lake in the local language is counted among one of the highest lakes in the world at about 4,142 meters (13,589 ft) above sea level. Capturing some photo shoots at this hilltop we hopped back into the jeep and drive near to the lake. From the parking spot we have to travel a little to reach the lake, it is a bit hilly place and the lake is down below. There was some other tourist also present at this place, we roamed around this place. The water of the lake is crystal clear and the peaceful environment surrounded by beautiful plantation and the orange marmots playing around in the area and the snow-covered mountains can be seen at a distance. After staying at this place for some time we started our journey toward our next destination of Kala Pani, another location of Deosai National Park. Kala Pani is another picnic spot and we reached there after nearly an hour drive. Known as Kala Pani or Black Water because of the appearance of the water as black liquid flowing into the river as seen from a distance. But when reached near the water is crystal clear, cold and refreshing. We stopped at Kala Pani and had a cup of tea that we brought with us from Chillum Chowki in a thermos. 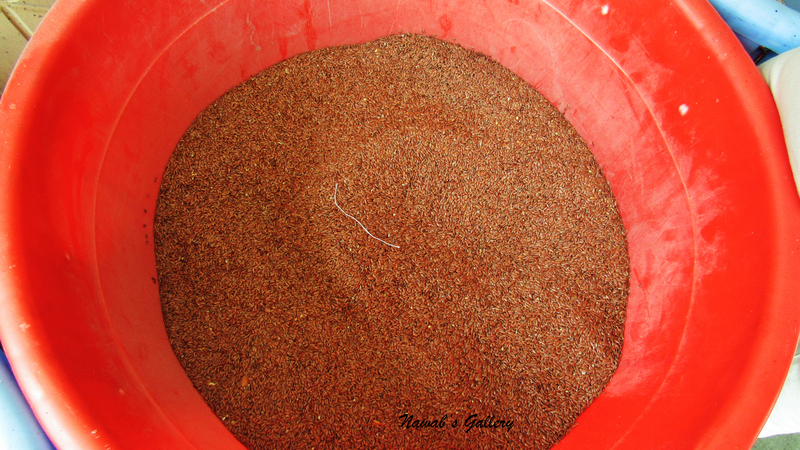 We found out that filling tea in a thermos from Chillum Chowki was a great decision as there was no restaurant at either Sheosar Lake or Chillum Chowki at this time of the year because of off-season. The scenic view of the Kala Pani was also stunning, the cold crystal clear water flowing in the river surrounded by small hills and beautiful plain with the snow covered mountains visible at a far distance. Drinking hot tea at this spot with an icy cold breeze was marvelous. We were unable to bear this freezing cold breeze so we decided to move toward our next destination of Bara Pani. 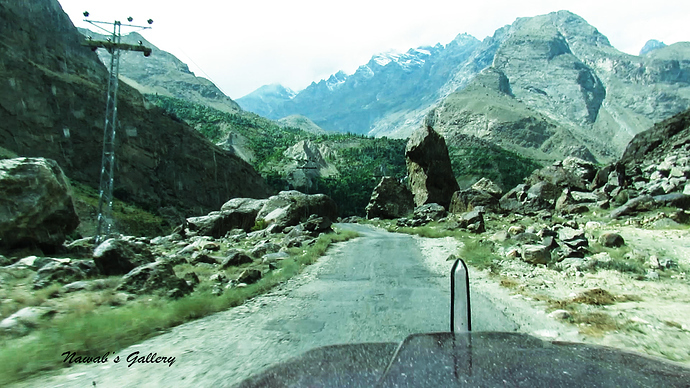 From Astore till Chillum Chowki the road was paved and smooth but after Chillum Chowki the road was unpaved, with the bumpy ride at some spots, we were in the jeep but we see many cars also travelling on this road and is easily manageable for a car to drive through this area with some height adjustment. From Kala Pani, the Bara Pani is at a distance of nearly 10 KM and it took about 1.5 hours for us to reach Bara Pani. On the way, there were many marmots roaming around and Yaks grazing the vegetation on the plain. Marmot is also known as rock chuck is a stout-bodied ground squirrel, about the size of a housecat. The yellow-bellied marmot is one of fourteen species of marmots and is mostly found in mountainous regions typically above 6,500 feet (2,000 m). Mostly feed on plant, insects and bird eggs, they have brown fur, with a dark bushy tail, yellow chest and white patch between the eyes, and they weigh up to 5 kg (11 lb). The scenic view of Bara Pani is astonishing, with the beautiful plantations of the plain and the river filled with crystal clear water flowing creating the stunning atmosphere. There was a single restaurant that was operational at this time of the season, the rest of them are close. Our driver informed us that the Yakhni (Soup) of this place is very tasty, but to our luck, the soup is all sold out and we were unable to taste that famous soup. We were feeling very hungry, so we ordered Channa Chawal (Rice and Bean) for us and that is the only food available at that place. Finishing the tasty food, we roamed around at this place for some time watching the flowing river, snow covered mountains and the beautiful birds hopping around for food. The weather all over Deosai is too cold and the ice cold breeze is making it very difficult for us to stay out for a long time, so we hopped back on the jeep. Our journey started again, there is a Wildlife Office at Bara Pani and they have tents for those who want to spend the night at this place, they also arrange for a hiking trip if anyone is interested in bear sighting but for watching bear one has to stay at his place for a day or two. You may also enjoy fishing in the cold waters at Bara Pani with the permission of WWF. This is the last picnic spot of the Deosai before Ali Malik, the entry point of Deosai from Skardu side and that was our next destination. The drive toward Ali Malik is now ascending up the hills and the beautiful plain, the flowing river at different spots, the grazing yaks, the marmots running around and many different species of birds flying all over the Deosai making it a marvelous drive. 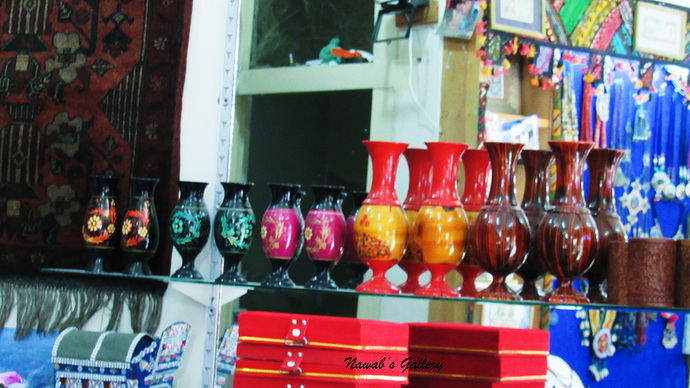 We stopped at many different places for capturing some photographs and then reached Ali Malik in about an hour. Ali Malik is a hilltop and for there a magnificent view of Deosai with lush green plain, the water streams and the snow-covered mountains can be seen. There is a single local restaurant made of wood and stones exists at Ali Malik. We opt for a cup of tea at this place and entered the tea shop, the only sitting place in this restaurant is the floor covered with carpet. We sit on the carpet, waiting for the tea to serve and having some chit-chat with the restaurant owner, the owner of the restaurant was very courteous and friendly. 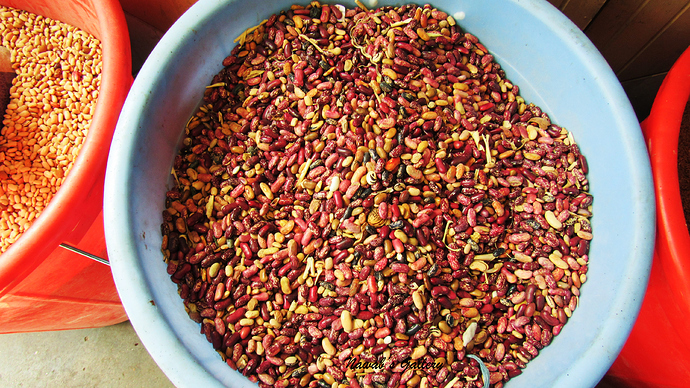 The tea served to us was made with the Yak’s milk and this is the first time we had the tea made with the Yak’s milk. Satpara Lake, our next destination is one of the most famous lakes in Skardu and the road toward Satpara from Ali Malik is descending down the mountain. 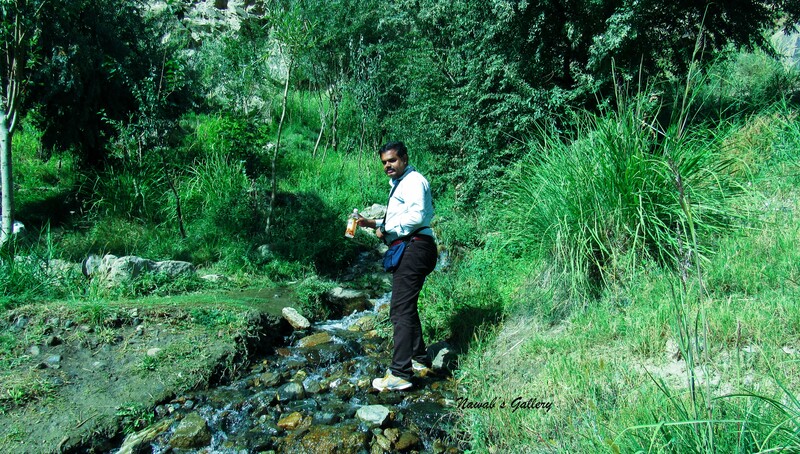 The trip toward Satpara was marvelous too, as the water stream is flowing in parallel with the road and at some place the mountains were barren but at the other place it is filled with vegetation. At different places herd of goats and sheep were grazing, there were many different colors of flora spread over the area creating a magnificent environment. 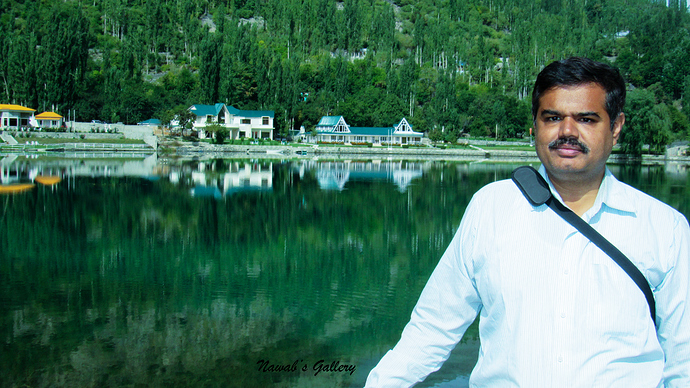 After driving for about an hour we reached Satpara Lake. Satpara Lake, the main source of fresh water supply to Skardu city is spread over an area of about 2.5 kilometers (1.55 miles) and is situated at an elevation of 2,636 meters (8,650 ft) above sea level. A dam is built on this lake to generate electricity that also enlarges the size of the lake. The lake is fed by the melting ice of Deosai plain through Satpara Stream. 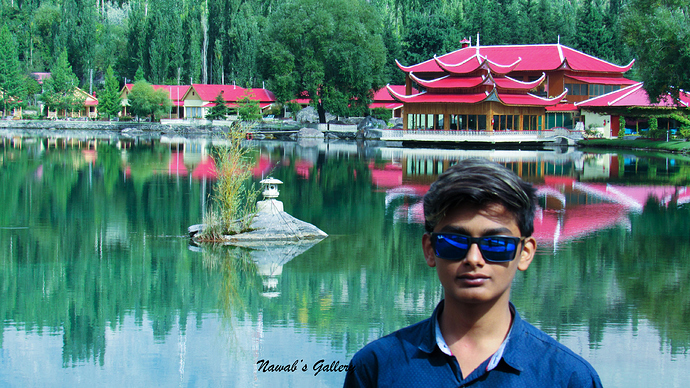 Staying for about half an hour at Satpara lake and capturing some photos we started our journey toward our today’s final destination that is Skardu city. 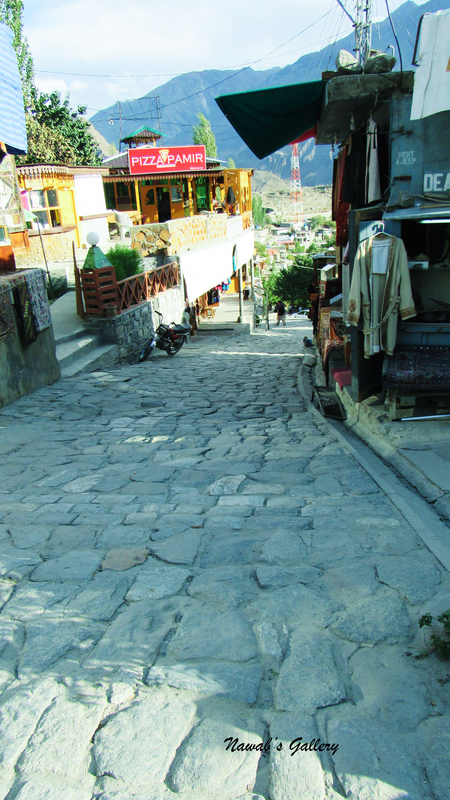 In about 30 minutes we reached the Skardu main bazaar and waited for our friends to arrive. 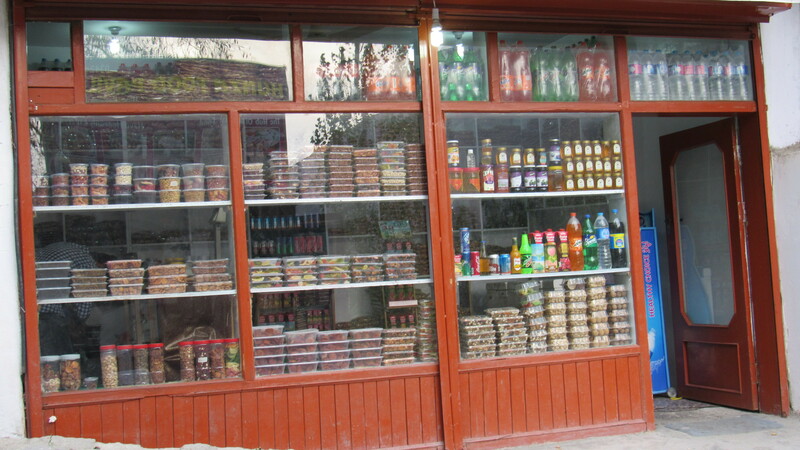 Our friend is from Skardu and arranged a hotel for us to spend the night a Skardu city and during the time we waited for him my wife visited different shops in the market. As soon as my friend arrives, we went directly to the hotel as we were too much tired because of today’s long journey. Our tomorrow’s destination is Manthokha waterfall and Khaplu, so after finishing the delicious dinner cooked by the hotel staff we went immediately for the sleep. Wazir Guest House in Rama was a gracious and decent hotel and we delivered a comfy night’s rest there. 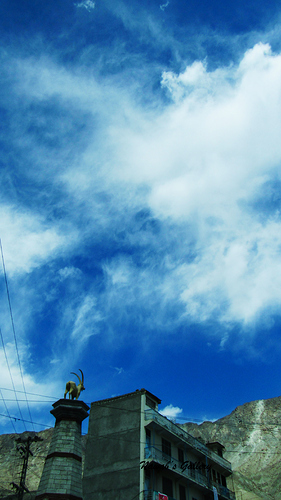 The morning was marvellous and the sky was clear too. Our today’s itinerary is for Tarsharing and Rupal, but foremost we had to have a breakfast. For that we stopped at a local restaurant in Astore city, the jeep driver told us that he needs to fix some clip in the jeep and while we have our breakfast he will read the jeep to the workshop for the fix. After finishing the breakfast we roam around in the Astore market, there were many different shops on the road selling clothes, electronic items, food, stationary, fruits and veg. We bought some fruits, biscuits, juices and other snacks for the road before leaving Astore for our journey toward Rupal. 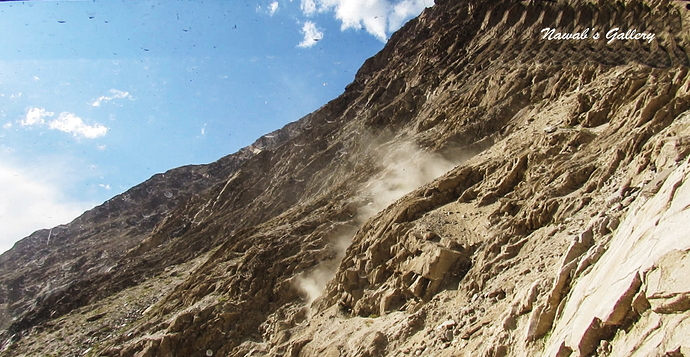 The road toward Rupal is paved, but single and passes through the famous Gorikot village. Gorikot, locally known as Gué is an important town for those who like to move either toward Deosai Plains or Rupal. In that respect are different restaurants, workshops and hotels for those who want to drop the night before continuing their journey. We stop at Gorikot for a while to buy some snacks and the cold beverage. Our journey again started and we selected the route of Rupla. Some few KMs of Gorikot there is a place where a river coming from above the mountains meets with Astore River, and this confluence of two rivers with different colours of water produces a sensational vista. We were going on the route where on one side is a beautiful river and on the other side is hilly. There are really beautiful spots on the way filled with lush green flora and waterfalls, the path crosses many small towns and reaches the most beautiful town of Tarshing. 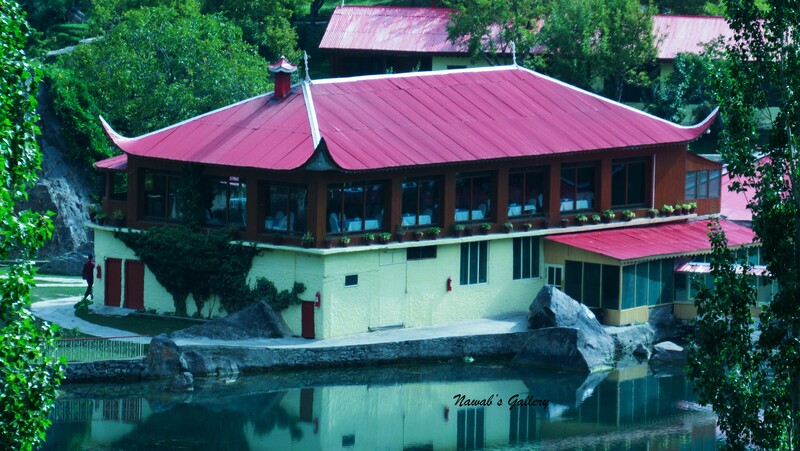 Being on the route of Rupal this town is a great point for those who want to take a rest on the way. This place offers food and other items for the travellers, including rooms that can be rented for the night halt. We bear to reach Rupal as early as possible so that we can return to Gorkot before sunset, thus we did not stop at Tarshing and continued our journey toward Rupal. The road after teaching is the only jeep able and other vehicles cannot travel along this road. After a mile from the Tarshing, there is a huge glacier that is known as Chhungphar Glacier and jeeps need to be ridden over this glacier. The glacier is formed with whole ice and rocks and it required about 10 mins to cross that glacier, with 4 Wheels drive function of the jeep. At some places, we even have to climb down the jeep to remove big rocks from the route. In that location were some men working on the route to fix the damage caused by the land sliding. 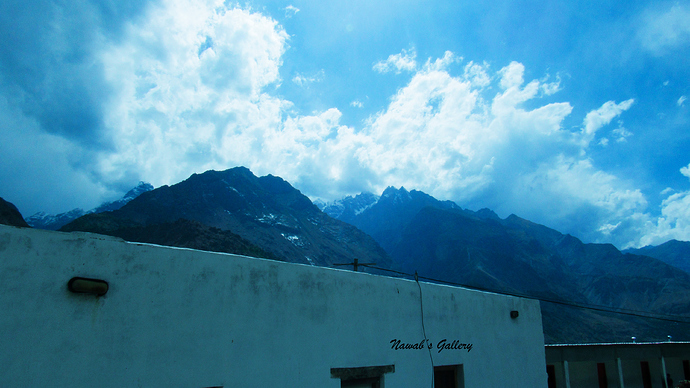 Rupal is a village in the Rupal Valley that lies south of Tarshing village and on the west end of Tarshing Glacier. 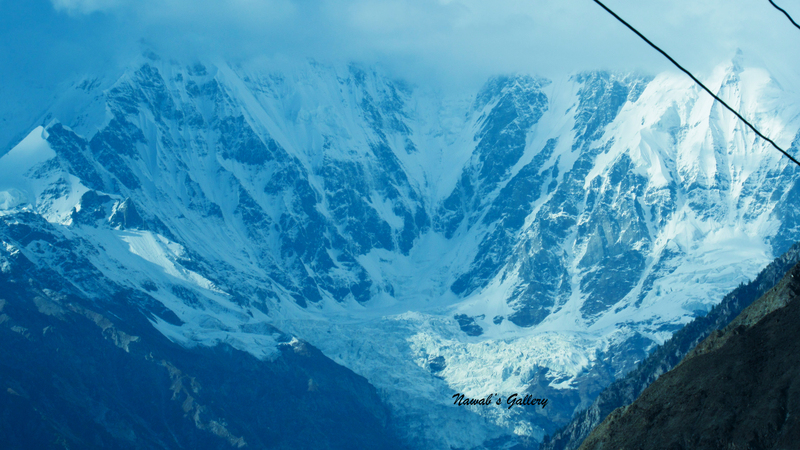 Surrounded by Nanga Parbat, Rakhiot Peak, Laila Peak, Shaigiri Peak and Chongra Peak Rupal is popular for treks to the Nanga Parbat’s Rupal Face, one of the highest mountain faces in the world, and to its north flows the Rupal Glacier which later forms the Rupal River. With vegetation all around the small town, the main source of living for the citizenry of this area, it is the most enchanting village. The women can be seen harvesting in the farm and men busy in herding cattle, there were some small children playing along the road. Rupal is completely a residential area and there is no restaurant or hotel at this place. From Rupal there is a road that leads to the base camp of Nanga Parbat but at the time when we were there the road was totally damaged and jeep cannot travel on that road, and we have no potential to trek till the base camp, so we decided to stay at the Rupal village. We wandered around, captured some photographs and then return to Tarshing. We travelled along the same route by which we reached Rupal and again have to push over the immense glacier. And the chilling effect of glacier makes us feel too cold. We stop at the other end after crossing the glacier to capture some photo shots, the glacier that was coming up from the mountain looks too marvellous and the surrounding is magnificent. Along the way back we saw some boys and girls in school uniform and with bags on their back walking toward Rupal. They were returning back to their home from school, these boys and girls daily take nearly a two hours of walk just to go to the school in Tarshing, and return back to Rupal in the evening. Crossing beautiful valleys and stunning places we reached Tarshing. Tarshing is a little township in the shadow of Nanga Parbat, with lush green environs. 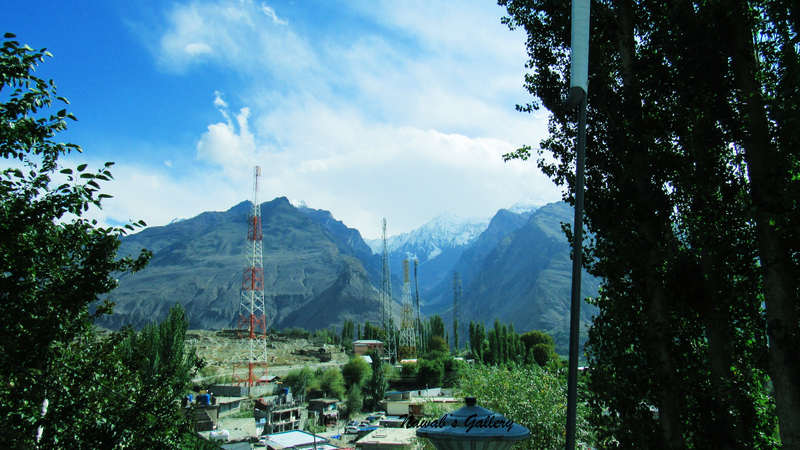 Connected with the power grid and presence of mobile phone network this town act as a major stopover for those travelling to Rupal and for hiking the Nanga Parbat. There were different hotels and restaurants in Tarshing, where the traveller can spend a day or two and can have food, so we decided to spend some time there and went into a hotel for a tea. It was a nice hotel with a huge lawn in front, tables and chairs were open on the lawn for the guest who wants to sit under the open sky and enjoy the environment. As we settled in the chair, we can see the mighty Nanga Parbat in front of us. With the beautiful surroundings and the fantastic weather, it is exceptionally stunning to sit in place and follow the mighty Nanga Parbat. The spirit we have at the gorgeous place can not be explained. The weather at Tarshing was chilling and the drinking hot tea makes us feel cozy. Since it was so alluring and captivating we decided to spend more time at Tarshing. Every one of us was feeling pleased and happy, and while watching the mighty Nanga Parbat and the mesmerize surrounding we placed an order for Chicken Soup. It took nearly half an hour for the soup to be served, and we utilize that time by capturing photographs. Winding up the delectable soup, it is now time for us to leave Tarshing and travel toward Gorikot, the town where we will be spending the night before going on to our next destination. 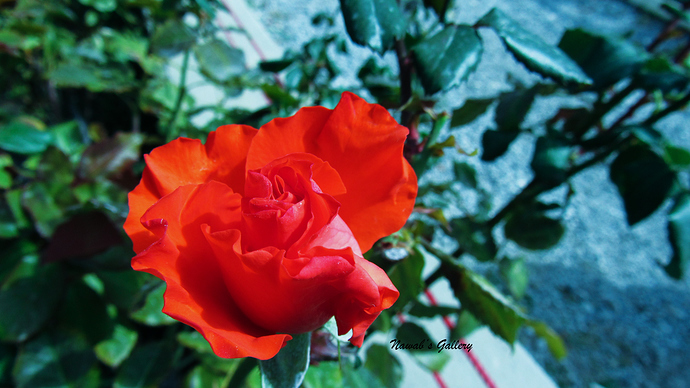 Rupal and Tarshing are no less beautiful than the Fairy Meadows, except that reaching Rupal and Tarshing is much easier than Fairy Meadows, and many facilities that are not available in Fairy Meadows is present at Tarshing. Passing through beautiful towns and travelling along the crystal water of Astore River we reached Gorikot. The night has fallen and it was very cold and we were so tired that we have no strength to search for a hotel, so we decided to stay in the first hotel that we found at the Gorikot. It was a small hotel and the rooms were really small too, but they have provided us with additional mattress and blankets that make it possible for us to pass the night there. 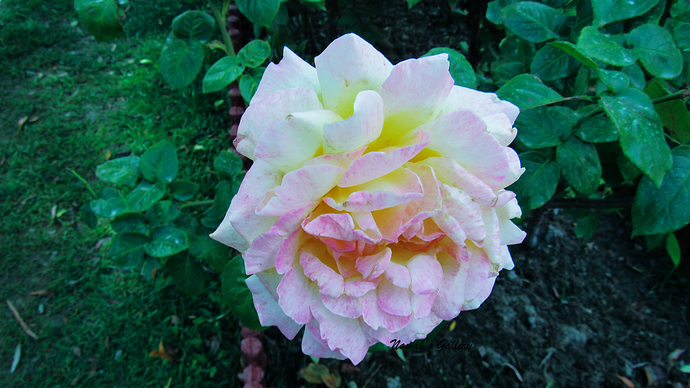 It continuously rained all the night and we have to return from Fairy Meadows in the morning. As we woke up the rain has stopped, but the Fairy Meadows and Nanga Parbat were completely covered with clouds and the whole surrounding was wet and frigid. We were concerned that if the rain gets down again we wouldn’t be able to climb down the Fairy Meadows, so we resolved to leave Fairy Meadows as early as possible. We have no potential to climb down Fairy Meadows on foot, hence we decided to hire horses so that we can travel speedily and avoid being wedged due to rain. As we needed four horses and it was very early in the morning it took a little longer time for our porter to arrange for the horses, but he has managed to do so. As soon as the horses were arranged our journey toward Fairy Point started on the same route by which we trek to Fairy Meadows. After spending three marvelous days we were leaving one of the most beautiful place on earth, the place that is enclosed by natural beauty under the shadow of mighty Nanga Parbat. The horses were smoothly and comfortably travelling on the stunning route that leads to the Fairy Point. Along the path there were rough patches and water streams but the horses were so well trained that they can carefully travel on that route. Since the weather was uncertain and rain can start at any time hence we didn’t stop at any spot except at the Midway Hotel for a little while to take a break. It was a stunning journey on a dangerous but beautiful track, and we reached Fairy Point in an hour. This time we were neither tired nor out of breath, reaching Fairy Point we went straight to the dining hall, and placed an order for the breakfast. We were feeling really hungry as we left the Fairy Meadows in a rush and didn’t have the breakfast there. 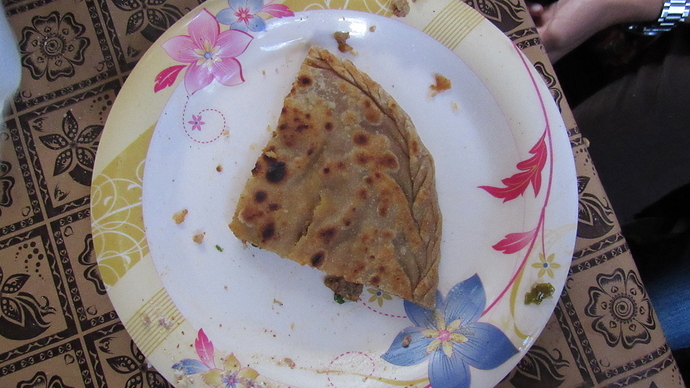 The breakfast of Paratha and Omelet was served in about 30 minute, it was a good breakfast and the tea was tasty as well. Finishing the breakfast we went to wander around the Fairy Point, since our jeep will arrive at 1 PM at the pickup point to lead us back to Raikot Bridge, so possess an ample time to spare at Fairy Point. When coming to Fairy Meadows everyone has to lay out the time in advance for return journey so that the jeep can come at the point at a predefined time to pick the passengers. And this time is really critical as if the passengers are not present at pickup point at the time, the jeep will left without waiting. Visiting different places, and sitting at different points we were enjoying the time at Fairy Point. The time goes by and now we have to leave Fairy Point and go toward the spot where we have to ride First Jeep till our pickup spot. Before pickup point there is a damaged route caused by land sliding some months ago, that route has to be crossed on foot as the road is so narrow that no vehicle can go on that route. The path was dangerous, but the locals there, help us to pass over that path. Our 2nd jeep was already present at the pickup point, and as soon as we ride the jeep our journey toward Raikot Bridge begins. This is the same rough and dirt route by which we made it here. Later on close to 2 hours of drive we hit back to Raikot Bridge, the place from where our journey to Fairy Meadows started and reaching back to Raikot Bridge ends our expedition of Fairy Meadows. 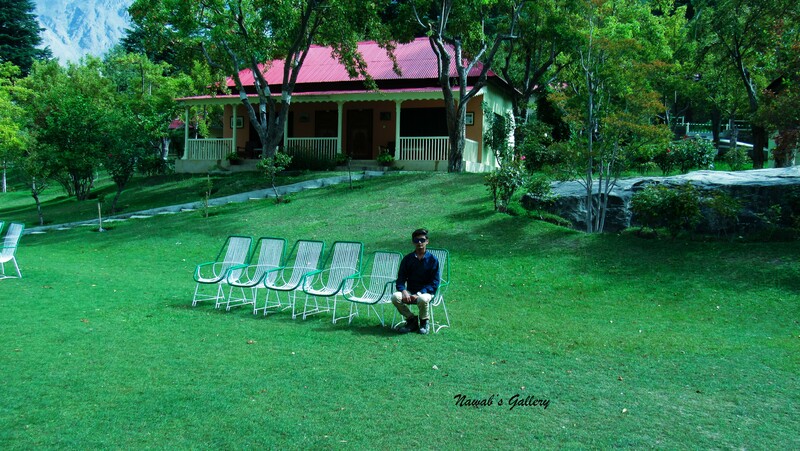 The weather at Riakot was too hot, while my family sits at a nearby hotel I started to fetch our luggage back that we stored in a shop before going to Fairy Meadows. Our program is to further visit to Rama Lake and Meadows today and for that we need to hire a jeep, but at this place the jeep rates were very high hence we decided to go to Jaglot and hire a jeep from there. 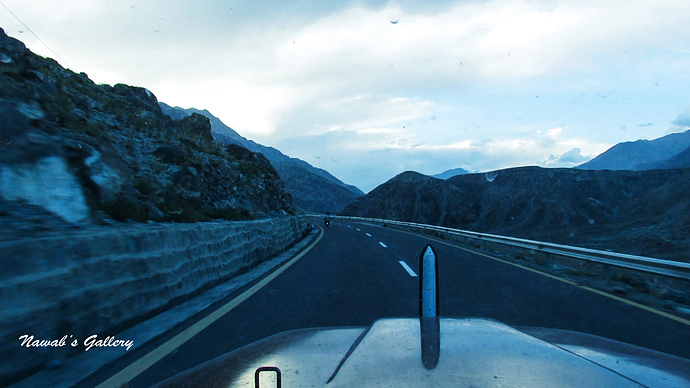 While travelling toward Jaglot on the famous Karakorum Highway our jeep driver asked us that as we are looking to rent a jeep for the trip, he can offer his services and at a reasonable rate as well. Finalizing with my family, we agreed to hire the jeep for rest of our trip. The jeep we hire is on daily basis and we have to fill up the petrol, the drive have to arrange for his own stay and food. Rama Meadows was covered with clouds and there was little rain some time before we reached Rama. Because of the weather people at that place told us to hurry and visit Rama Lake because it might start raining again. The road from Rama Meadows to Rama Lake is rough and because of rain, it has become muddy and slippery too. While moving along that road we hit a point where we have to cut through a glacier, crossing that the glacier was really captivating. The weather at that spot was intensely cold as there are huge blocks of ice along both sides of the route and we were moving in between. At approximately 10,800 feet above sea level Rama Lake is a big lake surrounded by snow covered mountains on all sides, and other side of Nanga Parbat can also be picked up from this position. 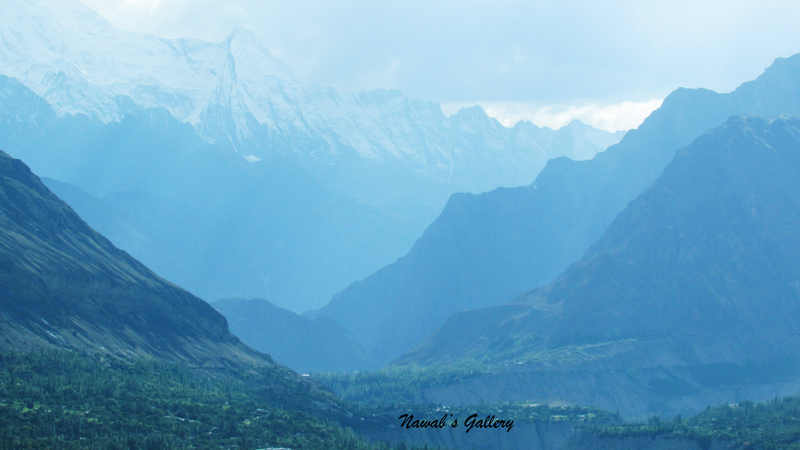 Since the area was cloudy we were unable to clearly view Nanga Parbat from that spot. Shuddering with cold, we captured some photos and then settled to leave Rama Lake as quickly as possible because there is a great probability of rainfall. Going back along that muddy road and crossing that ice burg we reach back to Rama Meadows. Now, as it was getting dark and cold, we have to arrange for our night stay. Along the way back toward Astore there were different hotels, but we found Wazir Guest House as a reasonable and a very nice hotel to stay. We haven’t had our dinner yet so we asked the Hotel Manager for the restaurant, but was surprised to know that their cook has already left because there were no guests in the hotel, and he informed us that we have to drive to the market for the food. But my wife had an idea and she inquired the manager if they own something that can be cooked and found that they have chicken and all other needed ingredients to prepare the chicken karhai (Chicken Currie). Recognizing that my wife resolved to cook chicken Kahlua by herself and it was after about 7 days that we delivered the dinner cooked by my wife. After the delectable dinner, we got into the room. The Wazir Guest House is an excellent hotel with a reasonable cost, it is at a location from where one can easily drive either to Rama Lake or can reach Astore city. The rooms were clean and comfortable and the bed is neatly made, at the time we were there it was a power breakdown, but they have a backup power source (UPS) arranging. The staff at the guest house was very courteous and friendly. It was really cold outside, but they have provided us with clean blankets that help us to deliver a nice comfy sleep. 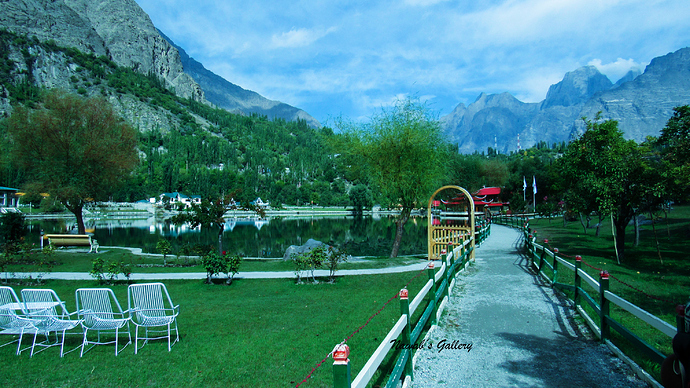 The morning at Fairy Meadows was alluring, and having a breakfast at this picturesque is a lifetime experience. We wouldn’t be trekking or riding to any other place today, but to roam around and explore the Fairy Meadows area. Finishing our breakfast we wandered around and after a while started walking toward Reflection Lake, it is on the other side of Fairy Meadows from where we were staying. Reflection Lake is a small lake at Fairy Meadows, it is famous because of its feature that one can view the reflection of the whole Nanga Parbat in the water of the lake. On the way to Reflection Lake, there is a big grassy plain where local boys were playing. At one side of the grassy plain there were some hotels and a camping ground, close to these hotels there is also a tuck shop and a Public Call Office (PCO) but that tuck shop only operates in tourism season. The camps that are set up at that station were very colorful and are fully ready to suit those who want to experience the adventure of camping at Fairy Meadows. Capturing some photo shoots at that place our journey toward Reflection Lake started again. 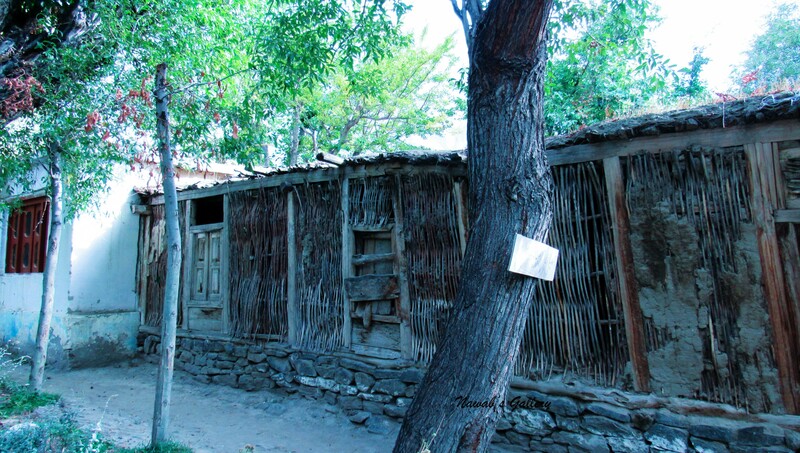 Along the other side of the grassy plain are wooden houses that belong to the residents of Fairy Meadows. Aside from TV Channels, Mobile Phones, Facebook, and WhatsApp they live a simple and innate life. There were horses, goats, and sheep and cows grazing all around the grassy ground, these cattle belong to the resident and provide milk, butter, and meat for their daily use. It is very much mesmerizing to walk about in this place, the luxuriant green grass the mighty mountains covered with snow and the pine forest surrounding the field, producing an enthralling environment. Walking slowly we reached the reflection lake, during this season the water at reflection lake is really low and most part of the lake is filled with dry weeds and woods. Along the position of the lake where we were standing there is no clear reflection of Nanga Parbat in water, but on the other side in that respect, there is small mound from where reflection can be seen clearly so we walk around the lake to arrive at the mound. 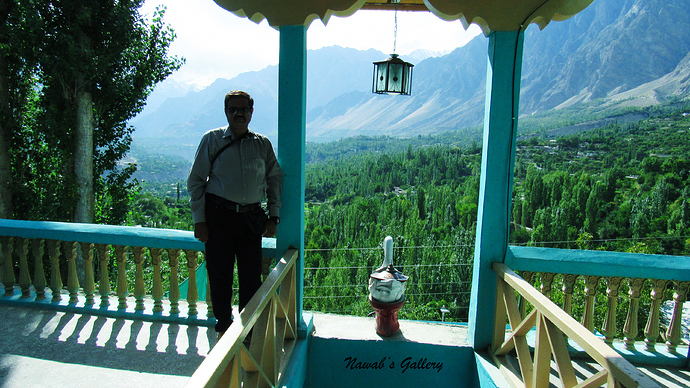 From that place the reflection of the whole Nanga Parbat is clearly visible, creating a ravishing ambiance, we caught some pics at that spot and then climbed that mound and sit on it. The lake in front of us looks like a large mirror lying on the floor in which one can clearly see the reflection of the spectacular Nanga Parbat, the Pine Forest, and the surrounding region. While we were sitting on the mound, my wife decided to visit the residential area. At that place the children were playing all round and the women busy in their everyday jobs. The women there were so pleased to see my wife among them, and they were so courteous that one of the women invited my wife to her house and attended to her with their local bread and tea. Not only she served the tea to my wife, but she also sends tea for me and my son on the mound. 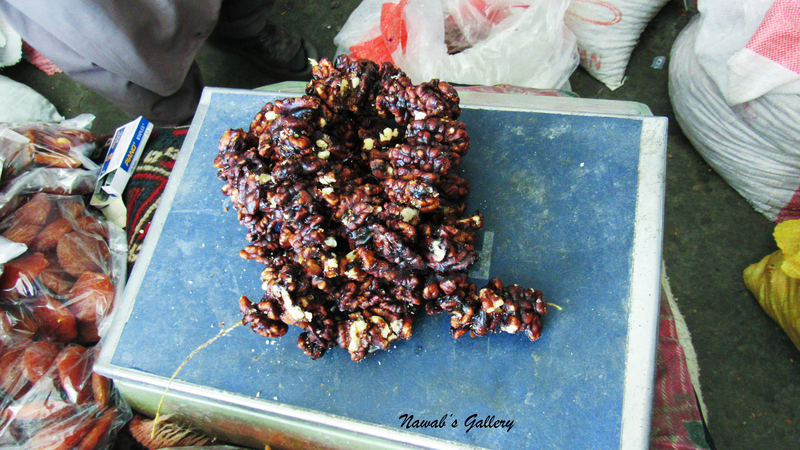 The tea was prepared with the goat’s milk and tastes great, this is the first time in our life that we had a cup of tea prepared with goat’s milk. At the rear of the mound there is a pine forest that leads down into the valley, and below in the valley, there’s a water stream flowing, creating a breathtaking scenery. While sitting on the mound we observed that clouds started to appear around the Nanga Parbat and it’s surrounding trying to curtain Nanga Parbat from our eyes. Roving the area, capturing some photos and enjoying the stunning panorama we slowly started to return to our hotel. It was midafternoon and the Fairy Meadows is fully covered with clouds, the clouds were so deep that the Nanga Parbat peak that was clearly visible few hours back is now totally disappeared. While arriving at our hotel we didn’t run into the room despite we wander around the field close to our hotel. Gradually the Pine Forest also disappears into the clouds and the clouds are now drifting down in the vale. Suddenly it began to drizzle and enjoying that fascinating climate, we take back to our hotel and sit in the corridor. 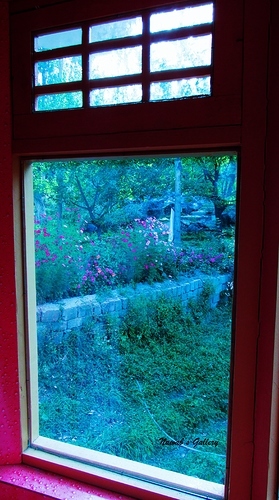 It was raining outside with loud thunder and while we were adoring the view, the night started to cover the Fairy meadows with darkness and nothing can be seen outside the corridor except the darkness and only the sound of the raindrops can be heard with the cold blowing wind. Now is the time for dinner and the kitchen was a little far from the rooms and it was continuously raining outside. With the help of umbrella that we brought from Karachi, we manage to go till the kitchen and place the order. We return back to the room and waited for the dinner to serve while discussing the next day plan. After about an hour the dinner of Biryani (Rice and Meat) was served. It was simply a nice Biryani (Rice and Meat) but it was after a long time we had a food that tastes good. The night was too cold outside but the blankets and the structure of the room do not let us feel the coldness and we have a nice comfortable sleep. On day 3 we traveled from Fairy Meadows to Bayel Camp. Fully exhausted and tired we reached Fairy Meadows last night. The night was very cold outside the room, but we bore a full night’s sleep because the room was comfortable as it was completely made of wood and we were supplied with blankets and sleeping bags. The morning at Fairy Meadows was marvelous but cold and the water in the tap was freezing cold too, but we were relaxed to know that in a nearby washroom there is hot running water available. At that place, hot water is available for a short period of time only in the early the morning because of the lack of electricity which is generated by nearby water turbines and there is no gas available too so they fire the water geyser with wood. There were wooden tables and benches outside our room, so we went outside and sit on those benches waiting for our breakfast to serve. Finishing our breakfast of Paratha, Omelet and tea we went inside to prepare ourselves for our today’s destination of Beyal Camp. Bayel camp, next to Rakhiot Glacier is a small romantic camping ground surrounded by Pine Forest in the shadow of Nanga Parbat at an altitude of about 3,500 meters. We picked our backpacks and hiking sticks and began our trek toward Bayel Camp. 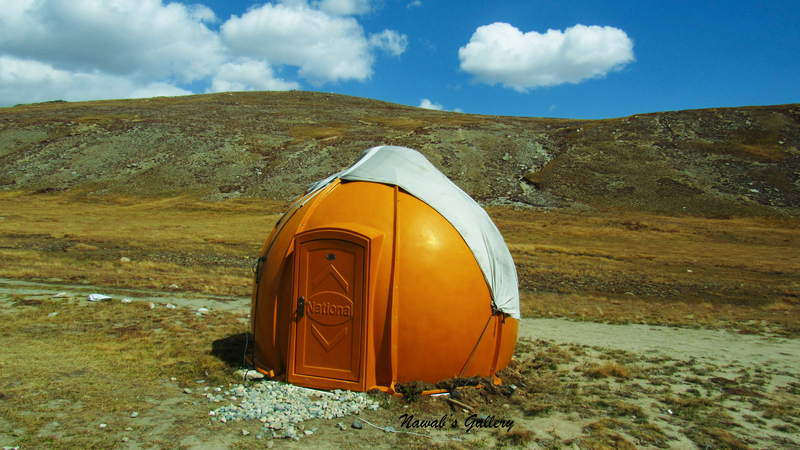 According to locals, the Beyal Camp is just a 2-hour walk and easy to accomplish. Bayel Camp can either be reached by trekking or on horses, this is the 2nd time we again made the dumb decision to trek to Bayel Camp. The lush green forest, the cold water streams, the grassy land, the glacier from Nanga Parbat and the waterfalls all making the path to Bayel Camp most beautiful trek we ever made. We were climbing upward on the mountain and after walking for some time on this stunning path we started feeling tired and out of breath, this is because of the inclined nature of the course. We have to cease to take a breath every 10 to 15 minutes. We also stop at different water streams to drink pure, fresh and cold water from the running steams coming above the mountain, this is the pure mineral water. We have covered about halfway to Bayel Camp where we meet a boy with a horse, first, we asked the children to take the ride till Bayel Camp but they resisted, so my wife who is much tired and breathless decided to ride the horse. Now only I and my children were trekking toward Bayel Camp and after almost 3 hours of walk over this stunning path we reached Bayel Camp. Turning over this astonishing and wonderful place we all forget our tiredness. At that place were different hotels and restaurants where one can have breakfast, lunch, dinner, tea, coffee or a bowl of soup. The hotels there were constructed with wood with rooms also available for those who want to spend a night or two at Bayel Camp. Nearby there was also a residential area and the houses there were likewise made with pure wood and clay and the life of the people there is totally dependent on the tourism. They too do some farming and rear cattle, but that is just for their daily living. We wandered about this stunning area enjoying every piece of it. We ordered tea for us and Noodles for children while exploring different parts of this fascinating meadow. The fantastic weather, the open view of Nanga Parbat and the woods all around giving us one of the most beautiful time of our life, the same feelings we experience when we visited the Hunza valley on our last trip. 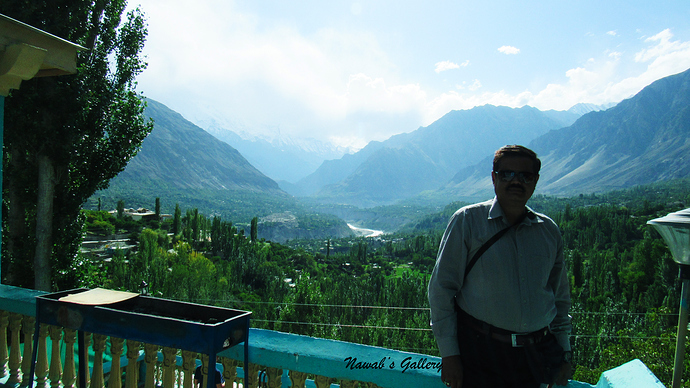 You can learn about our trip to Hunza Valley on my blog “From the South End to the North End of Pakistan”. There were many other travelers in groups hiking toward base camp or even further. There luggage were carried by some porters and even loaded on donkeys and some travelers were also riding the horses. Sticking around here for more than 3 hours now is the time to turn back to Fairy Meadows but this time we decided to hire horses instead of trekking back. The plan was to ride till the Nanga Parbat Viewpoint first and then return back to Fairy Meadows. The route to the Viewpoint was rough and rocky, but it’s a short path of around 30 minutes. This is the spot from where one can hold a clear view of Nanga Parbat, Rakhiot Glacier and the Karakoram Ranges. 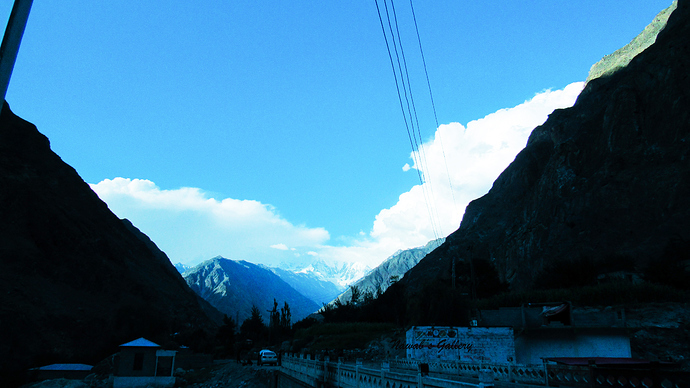 After holding a photographic session our return journey toward Fairy Meadows started. The journey was on the same beautiful route by which we reach Bayel Camp. 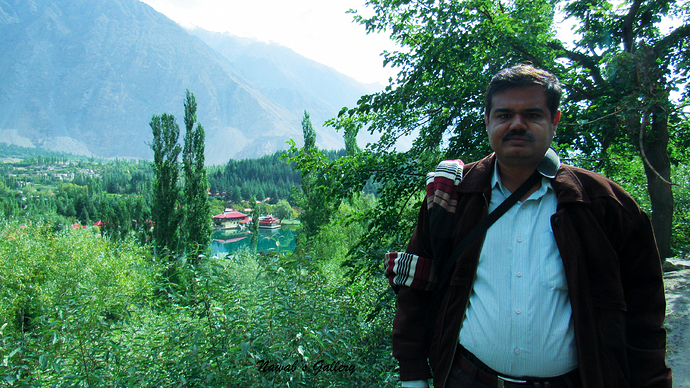 With beautiful view all around, crossing marvelous water streams and pine forest we reached Fairy Meadows before sunset. As the sun sets the Nanga Parbat appeared to be covered with gold because of the light from the sun. 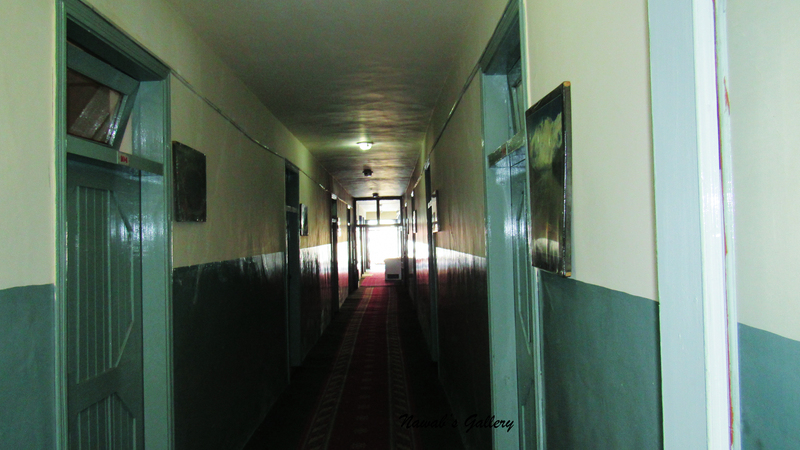 We sat in the corridor and look out the miraculous transition from day toward night. The night at Nanga Parbat was too dark, we have never experienced such a dark night in our life and the sky was completely black and we can see thousands and thousands of stars twinkling in the sky. This is the first time that we have witnessed the sky with so many stars. We enjoyed this movement and sit around the corridor for a long time and after the dinner, we went back to our room to catch some sleep. 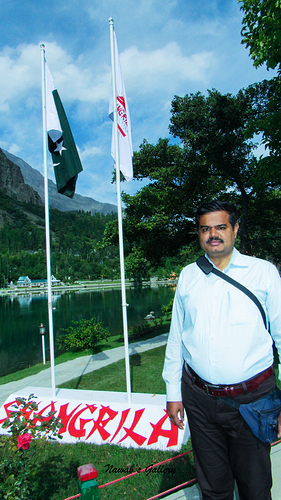 The 2nd day was a very exciting day for us, as we will be travelling to our destination, Fairy Meadows. The route to Fairy Meadows is in three steps, 1st till Raikot Bridge on Karakoram Highway, then in 2nd step Jeep ride to Fairy Point on Nanga Parbat Mountain and then the 3rd and final step is a long trek to Fairy Meadows. We woke up early in the morning, packed our luggage and got downstairs for breakfast. Before we moved downstairs, my friend called me and informed that he will be coming to pick us and will drive us till Raikot Bridge as we should hurry since the route to Fairy Meadows is very long. We ordered Parathas, Omelet and tea for breakfast and before we finish off our breakfast my friend arrived and began keeping our luggage in the trunk. Directly after eating our breakfast we ride in the car and started travelling toward Raikot. We cut across the primary market of Chilas and then we go through the residential area of Chilas. This is the first time we see the Chilas main city and found out that Chilas is a great township with many houses, workshops and farmlands. Most of the people of Chilas are farmers and one can see many harvested lands and garden all around, this makes this part of Chilas very beautiful. 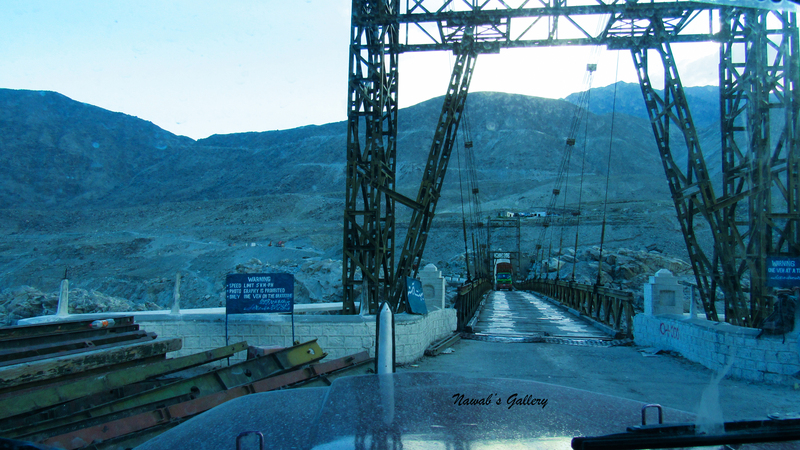 Crossing Chilas town we join back the Karakoram Highway and now travelling in the direction that leads to Khunjerab Pass, the highest border of the world. 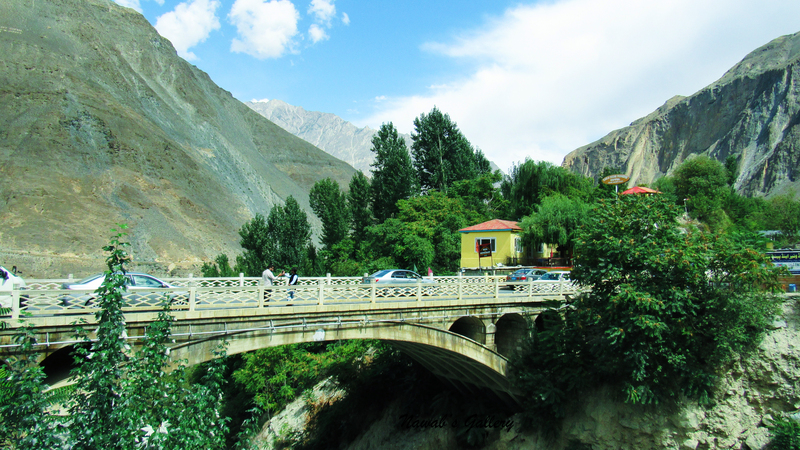 But we will simply be travelling till Raikot Bridge as at present we don’t have any plan to visit Khunjerab, as we had visited Khunjerab on our previous trip. 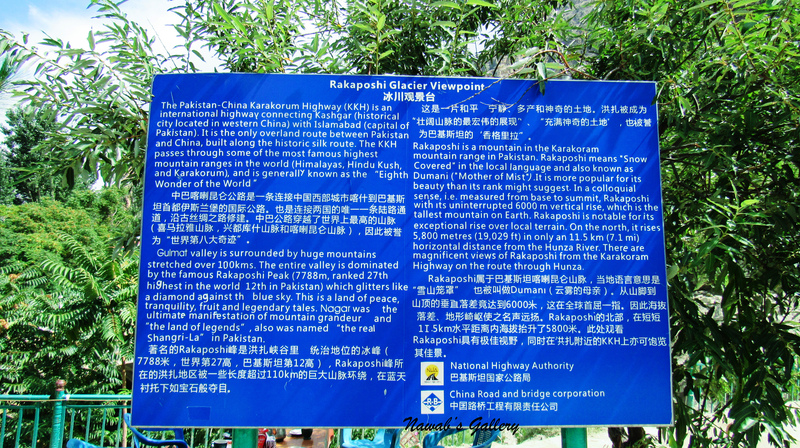 You can read about our trip to Khunjerab on my travel log “From South End to the North End of Pakistan”. 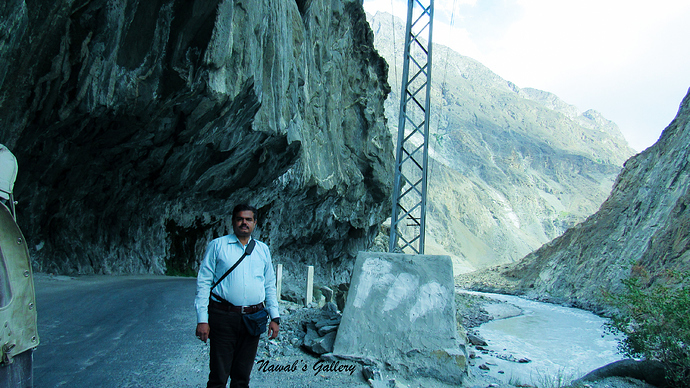 We were travelling on Karakoram Highway Chilas on our right-hand side and River Indus on our left-hand side. 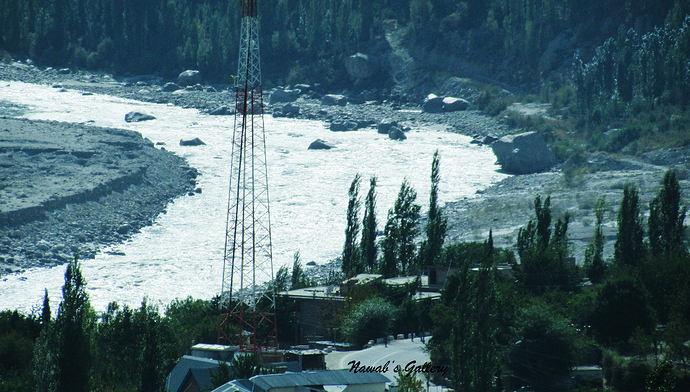 With the length of approximately ‎3,200 km (2,000 miles), Indus River is one of the longest rivers in Asia. It flows through Pakistan, India, China and Western Tibet. 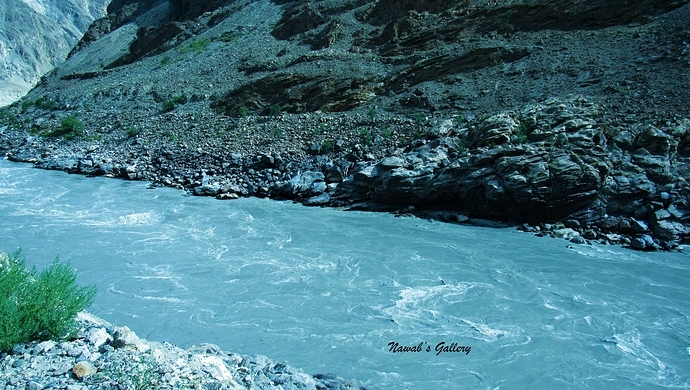 Originating in the Tibetan Plateau in the vicinity of Lake Mansarovar, the river runs a course through the Ladakh region of Jammu and Kashmir, towards Gilgit and Baltistan and then flows in a southerly direction along the entire length of Pakistan to merge into the Arabian Sea near the port city of Karachi in Sindh. It is the longest and national river of Pakistan. The route to Raikot is rough terrain and the weather was too hot outside the car. 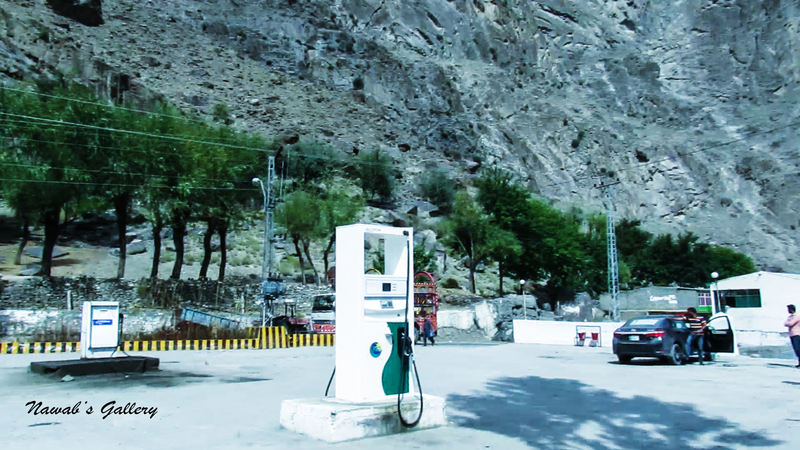 Along the Karakoram Highway, there are small towns, petrol pumps and some tuck shops. 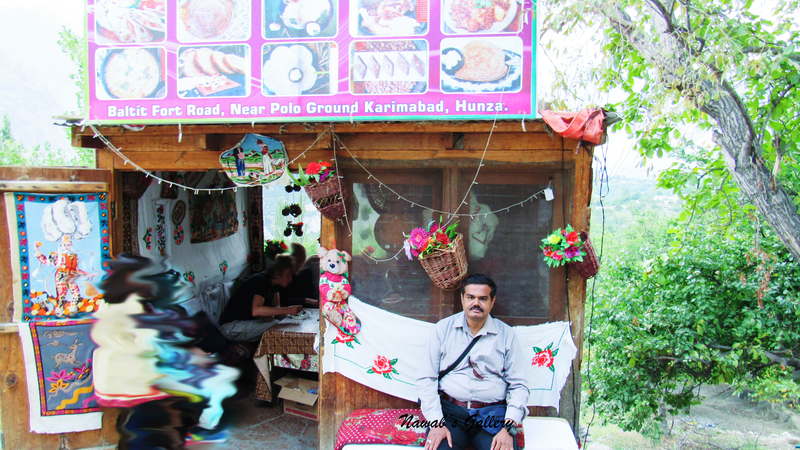 We stop at a shop for mobile pop-up and to purchase some snacks and went along our journey toward Raikot. A few kilometers from Raikot we have to stop behind a long queue of traffic and found out that there was a land sliding on the Karakoram Highway in the morning and the road is blocked due to that land sliding. Only we were relaxed to get the good news that heavy machinery is clearing the road and the road will be clear for traffic after 15 to 20 minutes. It was a long waiting line of traffic that includes a large number of trucks but as the road opens they first let all the cars to pass, so our journey starts again after wasting of nearly 45 minutes. We reached Raikot in nearly 2 and half hours, Raikot is a point from where the 2nd tone of the journey starts and from here one has to depend upon a jeep to travel to Fairy Point. Fairy Point is a place halfway before Fairy Meadows. We cannot take our luggage to Fairy Meadows so dropped our luggage at my friend’s known place, pick our backpacks and ride on the jeep. The road to Fairy Point is a very narrow, rough and dirt road, and our journey starts with a lot of jolts and jumps as we start going upwards on the Nanga Parbat Mountain. Every bit we were going up the River Indus and the Karakoram Highway down blow started disappearing slowly. 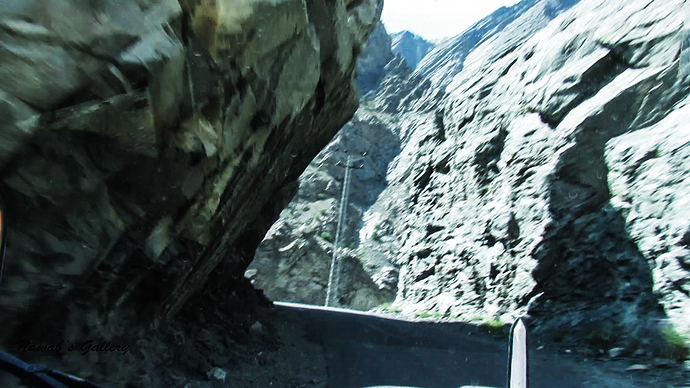 It is a dangerous road, but the excitement to reach Fairy Meadows is giving us courage. It is about 2 hours of a ride with High Mountain on our right side and deep valley along the left. The road is so narrow that only one jeep can go at a time and if another jeep comes from the front then one of the jeeps has to break off at the side of the mountain to give way to the other. After 2 hours of the drive, we hit a stage where a month earlier there was a land sliding that has entirely ruined the road at that point. This spot is nearly 10 KM from Fairy Point and here one has to get off the jeep and need to walk over a very narrow, rocky and dangerous path, there was a very low fence on the side made by the local residents to provide some safety. The local people at that place were really helpful and they aided us to pass over that dangerous path. Along the other side, there was another jeep waiting for the passengers to get them to Fairy Point. Then we ride on the jeep and in less than 30 minutes to reach near Fairy Point. The jeep drop us at the edge of a valley and the Fairy Point Hotel is on the other side, once there was a bridge that links both sides of the valley but now it is destroyed and people have to walk down into the valley, cross the water stream and then climb back on the other side to reach Fairy Point Hotel and the trek route of Fairy Meadows. 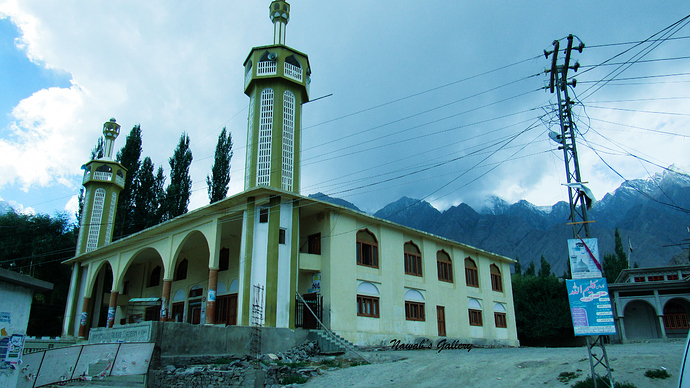 Fairy Point is at Jeel (also known as Tattu, Tattu village is on opposite side of Fairy Point) is a place with a restaurant, a hotel and a mosque. From this point the actual trekking to Fairy Meadows start, where one can hire a porter to carry luggage and can too engage a horse to ride till Fairy Meadows (if one do not want to trek). While we were crossing the stream to reach Fairy Point a boy aged nearly 13 reached us took our luggage and helped my wife and children to cross the watercourse. Reaching Fairy Point we sit in the restaurant and asked for the lunch. We were informed by the waiter that only “Mash ki Daal (Bean Curry)” and “Roti (Bread)” can be made available only later an hour because the chairman of Gilgit-Baltistan is travelling toward Fairy Meadows and will be at Fairy Point soon and everyone will become engaged with him. So we inquire for a room and move there to take some rest. It was a neat and clean room built with wood and plaster, the room has two beds and an attached bath. After taking a nap and roam around the area for about an hour we were informed that lunch is ready and we can move downstairs to the dining room for lunch. Finishing our lunch we got outside to arrange for a horse for kids but it didn’t set because of the fare and kids also resisted to ride the horse. We only hired a porter for our luggage and began to trek toward Fairy Meadows, this is the dumbest decision we have made as we have no idea of the length and toughness of the path. It was a marvelous path with Nanga Parbat covered with snow in our front, the beautiful green forest on the sides, the river flowing down in the valley and the Karakoram Ranges at the back. First, the walk was so wonderful, we were talking to each other and porter was telling us about the surrounding areas and nearby villages about the life of the people and their daily routines, but suddenly we started feeling out of breath and tired this is because of the inclined path that we were going up. The route was really beautiful, but tiring and we bear to stop to hold a breath every 10 or 15 minutes, but our porter continuously motivated us. From Raikot (Karakoram Highway) where we began our journey toward Fairy Meadows there were no cell phone signals, neither at Fairy Point and we were told that there will be no cell phone signals either at Fairy Meadows. Only during our trek, we arrived at a stage where we were surprised to know that we can make calls or SMS from this place as this is the only 6 x 6 foot area where mobile signals of all service providers are available able despite being in that respect is no mobile towers nearby. We made some calls to our family members back at home and then went on our trek. 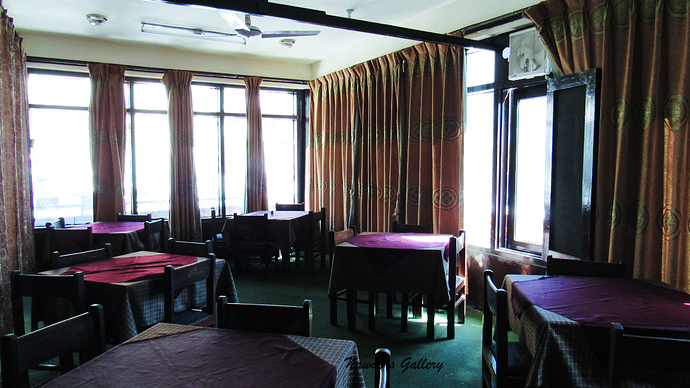 We reached a place where there is a restaurant, the restaurant was completely constructed with wood and it is named as “Midway Hotel”, our porter told us that we are at the midway of our trek and we will have a break here for snacks and tea. We placed the order for tea and noodles for children and then sit on the wooden benches for having some rest. Our trek to Fairy Meadows again started after concluding the tea. The path we were travelling is exceptionally beautiful the snow-covered mountain, the lush green forest, the cold water streams coming from the mountains and the sheep and goats of the residence grazing around. 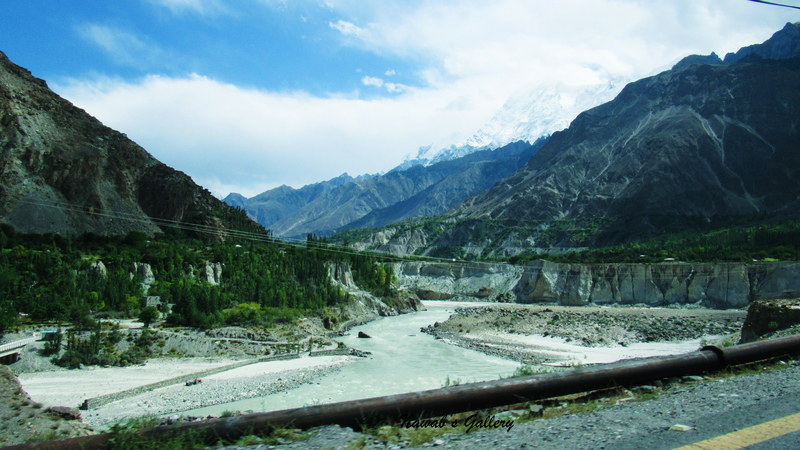 On the way we saw a power turbine installed by locals on a water stream to provide electricity to Fairy Meadows and surrounding. It was getting dark, so we increase our speed and we reached Fairy Meadows few minutes after the sunset. Extensively tired and out of breath we reached our destination “The Fairy Meadows”. It was totally dark and the weather was excessively cold, we all were wearing Jackets, Mufflers and Gloves but still shivering, only there was bonfire arrangement and we now sit around it to get ourselves warm. We haven’t booked any room in advance, hence we have to look for the room but fortunately, the place where we were sitting around the bonfire there were rooms available so we went to check the rooms and decided to stay there. Our porter placed our backpacks in the room and after sitting for a short time around the bonfire we went into the room to have a deep sleep. And that concludes the 2nd day of our trip.